Click on the photo to enlarge, and the back arrow to return to original size. Well the sunsets are earlier and the realization that summer is coming to an end is haunting me. I like the spring, love the summer, can tolerate the fall and despise the winter. The thought of snow, cold and shoveling is making me sad already. I don’t go by Labor Day as my guide to the last day of summer. No, I hold on to the bitter end and wait until the first day of Autumn shows up on the calendar. This year, it’s Saturday, September 22, 2018. Although, a few weeks ago in the Northeast it was still in the high 80’s and humid and as if someone flipped a switch, it became cool, breezy, raining and 57 degrees with a high of 68 degrees after Labor Day. 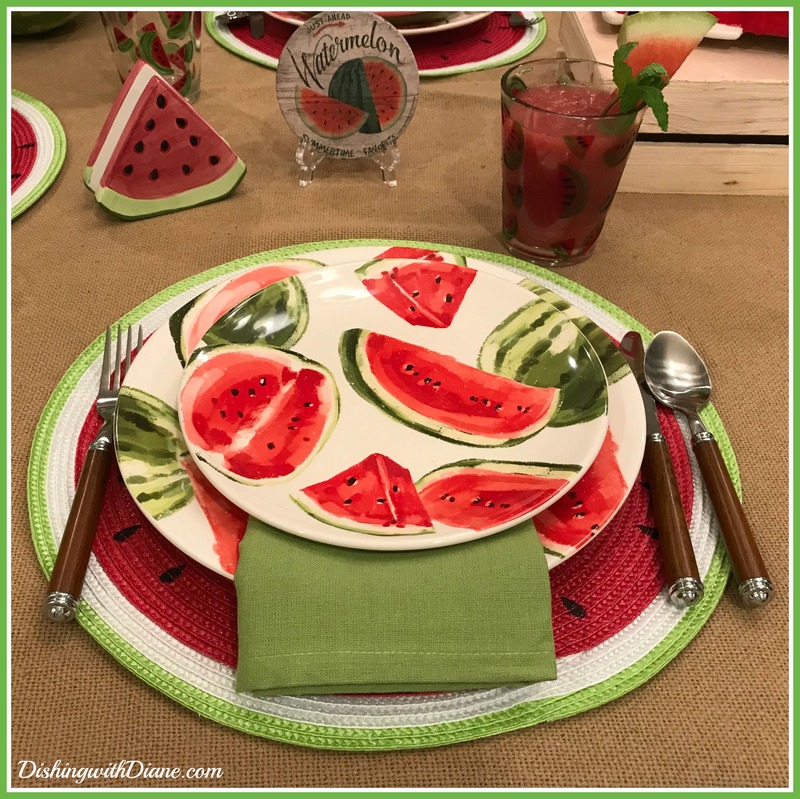 I didn’t know what my Goodbye to Summer Tablescape would be and then one day while shopping in Pier 1, the best idea was right in front of me – Watermelons! 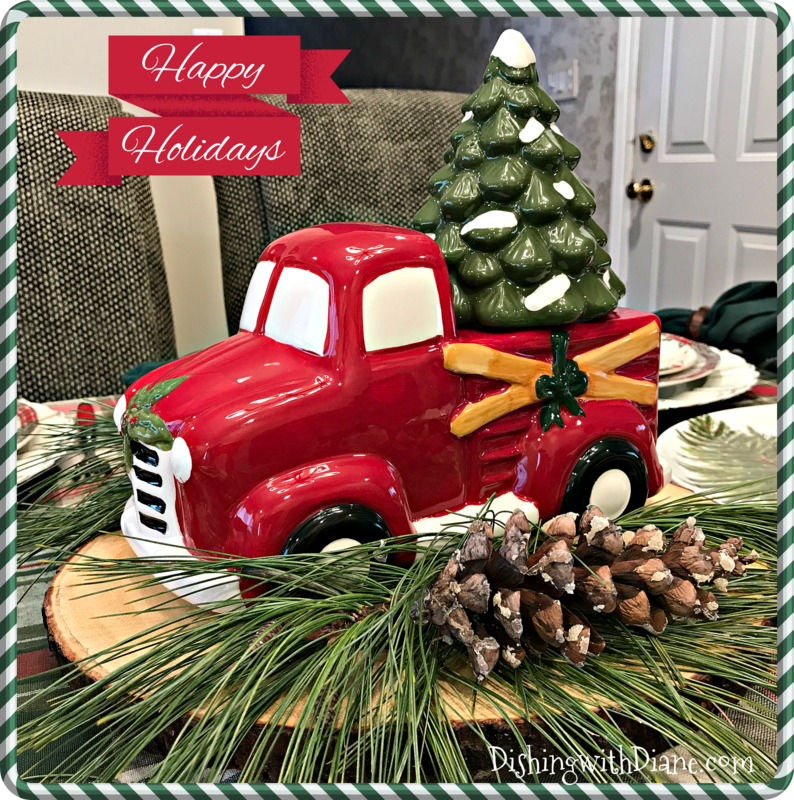 Many of you might remember my obsession with the vintage red truck cookie jar at Christmas. 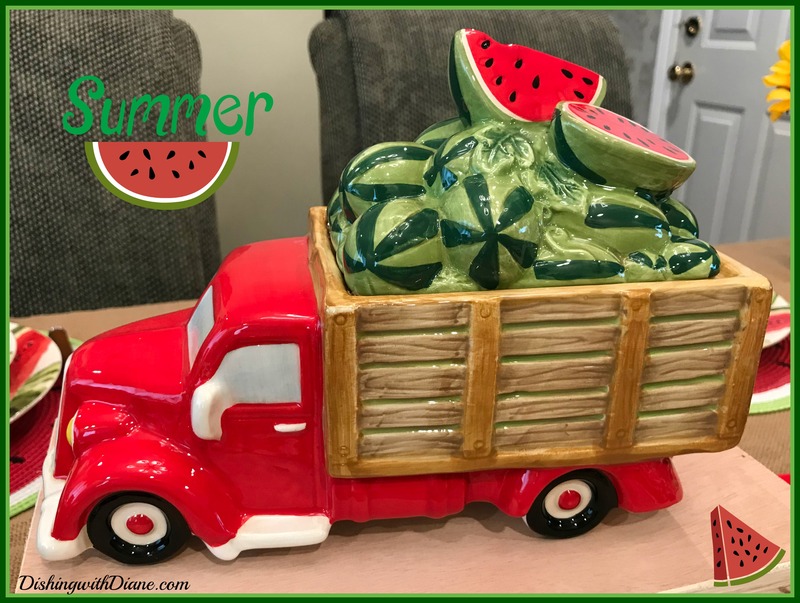 Well, Pier 1 has a vintage red truck cookie jar filled with watermelons and a tray to match. That is all it took to get me started. Watermelon happens to be my favorite fruit and I constantly buy them all summer long. 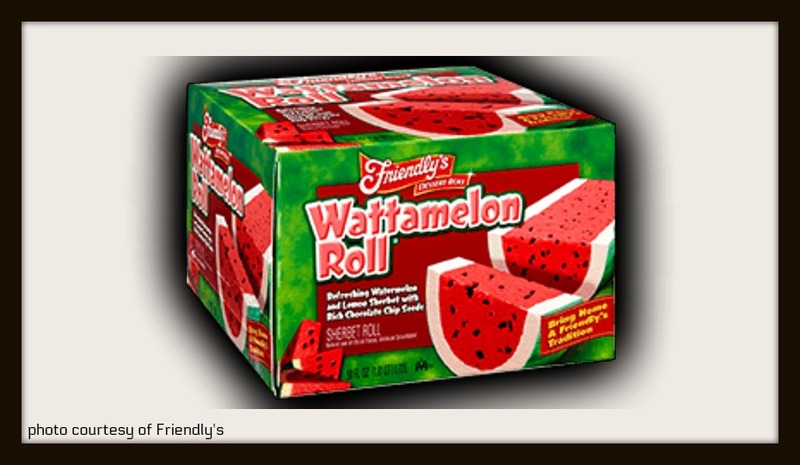 (Along with Friendly’s “Wattamelon” ice cream roll). 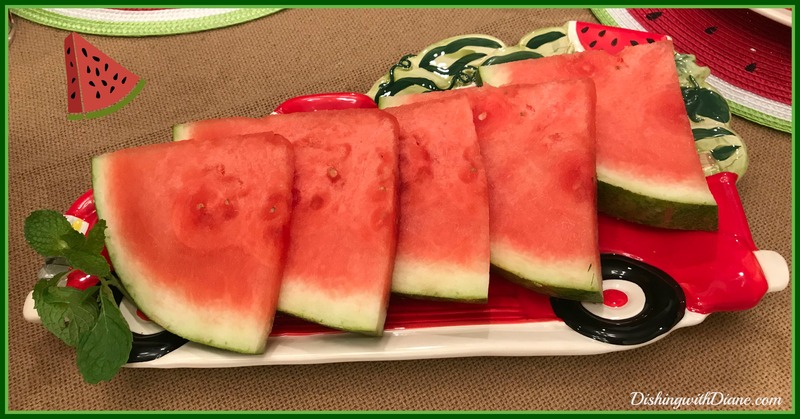 So, it looks as if Watermelon is now the “2018 Goodbye to Summer” theme. To prove my love of watermelons, I even have a “watermelon shaped” clutch bag. 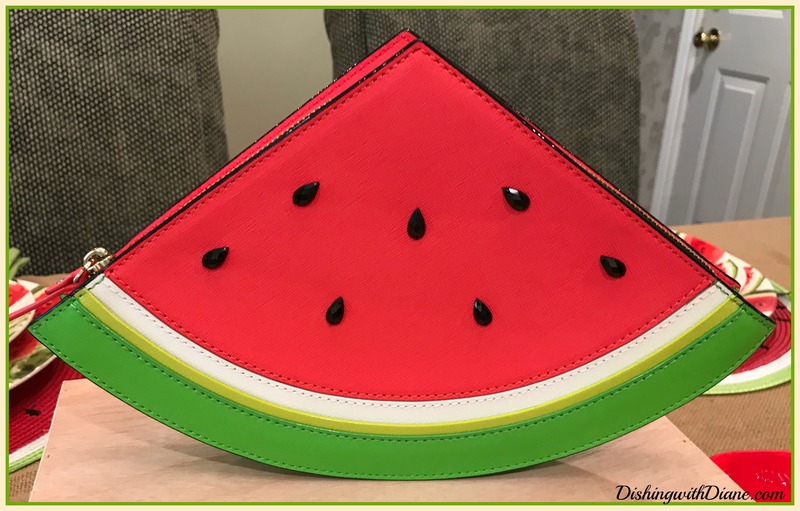 So, after seeing the clutch bag, I know what you are thinking and yes, I have watermelon dishes (two different sets actually). The set I am using today and another set that I use for dessert. 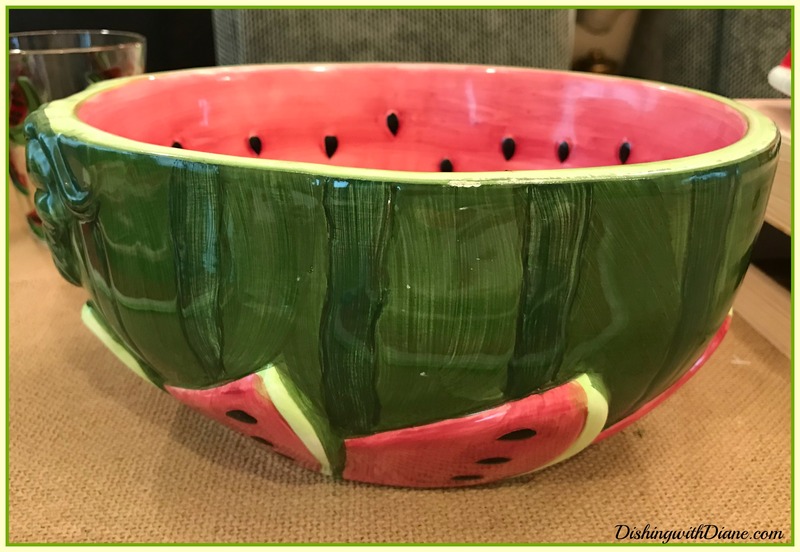 This is an additional watermelon serving bowl that I will be using on today’s tablescape. First, the tablecloth. 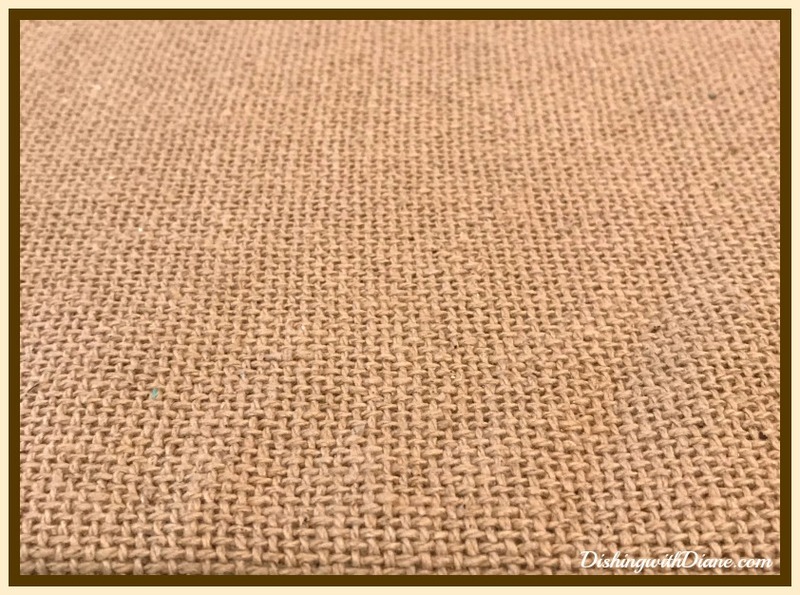 I am going to use burlap for a neutral background. Solid green napkins to pick up one of the shades of the rind from the dishes. This time I placed the folded napkin under the salad plate and have just a small portion exposed. I want the focus to be just on the dishes. 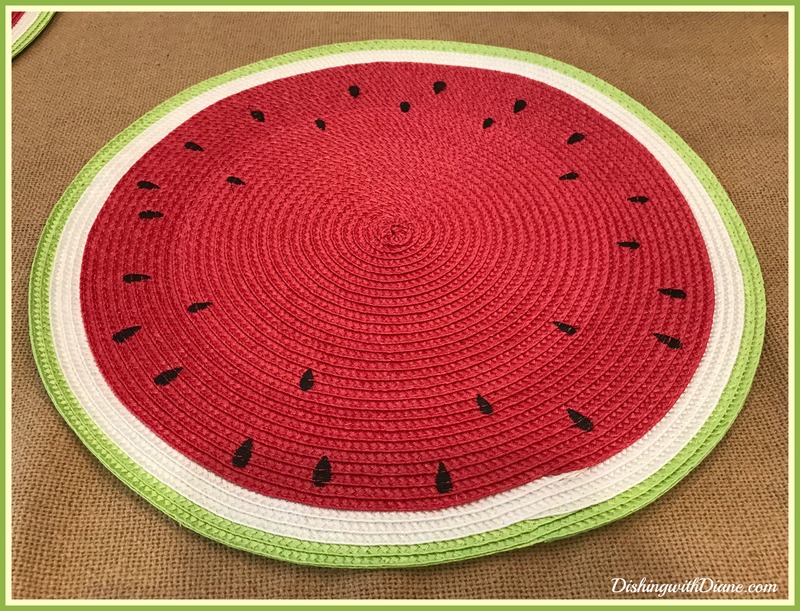 The placemats can be nothing else than a woven slice of watermelon. No charger plates because you wouldn’t see the placemats and they are too cute to hide. 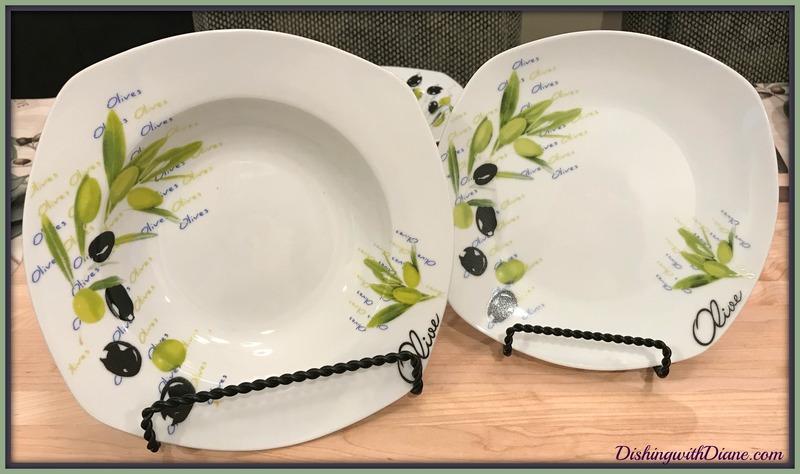 Now the dishes…The dinner and salad plates are exactly the same to this set and there is also a small salad bowl to match. 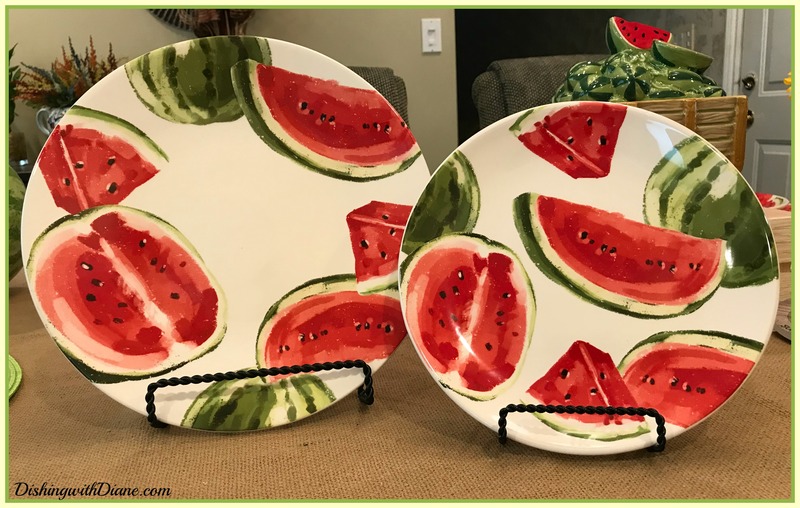 The dishes are ceramic with a white background with various sizes and shapes of sliced watermelon with shades of green and the deep pink of a ripe watermelon. Just the color alone is refreshing. 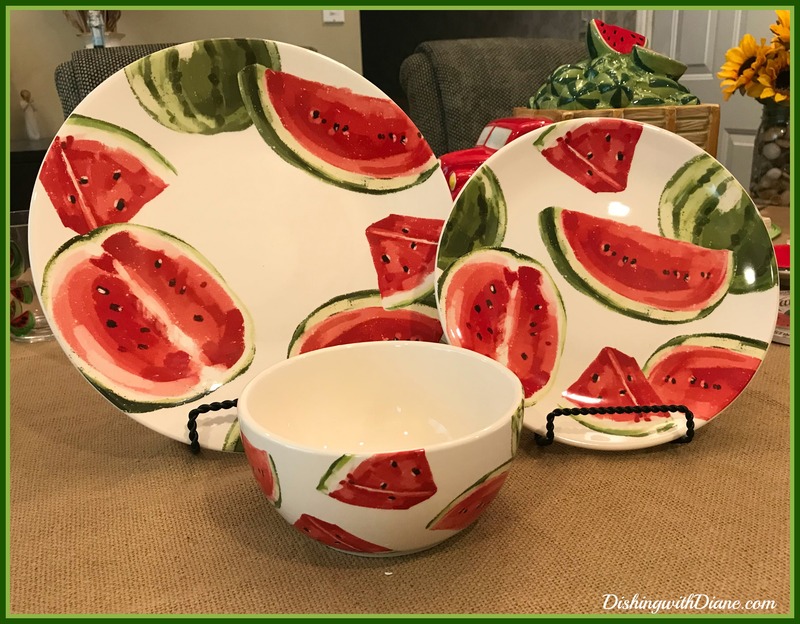 Here is my second set of watermelon dishes that I use just for dessert. The dessert plates are melamine for outdoor use and the pattern is similar to the other dishes. It has a white background with not only slices of a watermelon but a whole watermelon as well. 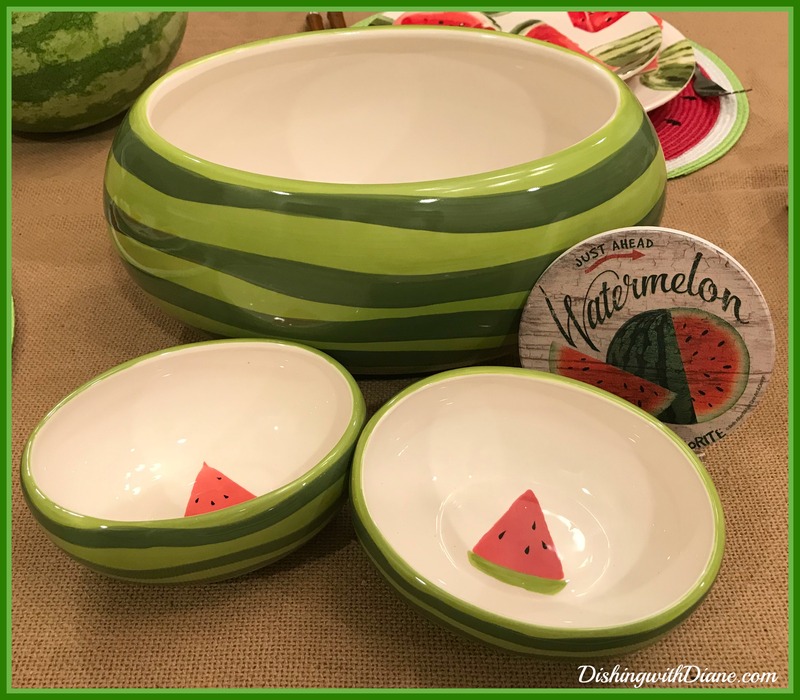 The serving bowl and dessert bowls are also ceramic and just too cute. Even though the bowls and dishes are not part of the same collection, I think they look great together. 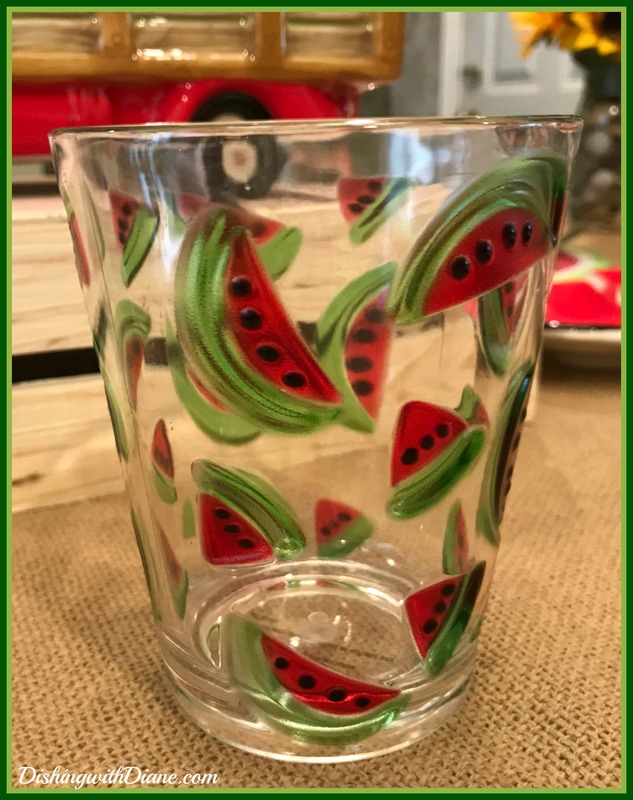 Glassware will be clear acrylic tumblers with a design of watermelon slices. Later they will be filled with a watermelon beverage, mini wedges of watermelon and refreshing mint. 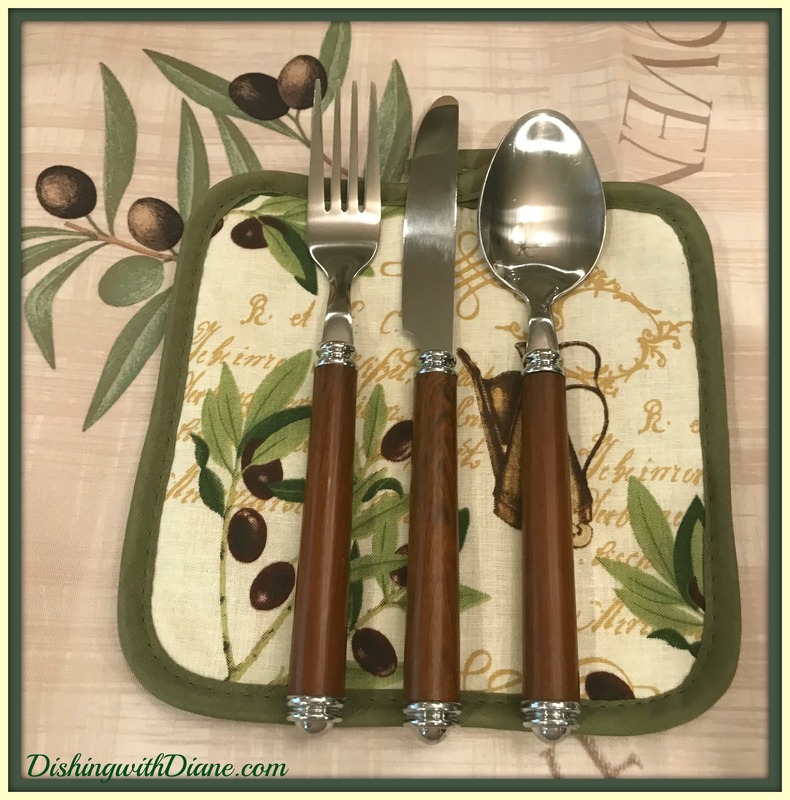 Flatware is brown to continue the neutral feeling. Here it is, my new red vintage truck & watermelon cookie jar. I just love it. The cookie jar truck has a lid piled high with watermelons. (I am sorry I didn’t buy this sooner so I could have displayed it in my kitchen the entire summer). To give the tablescape some height, I am placing the truck on an inverted crate. 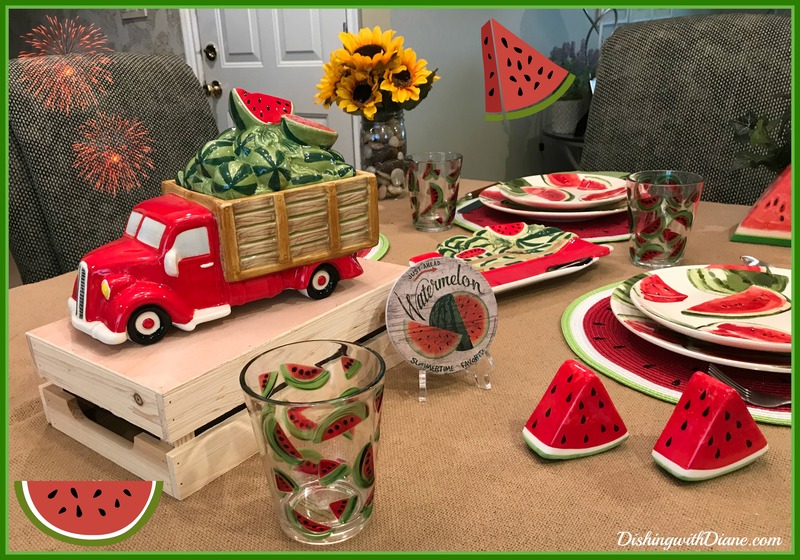 The platter is also a red truck with a cargo of watermelons and matches the cookie jar exactly. 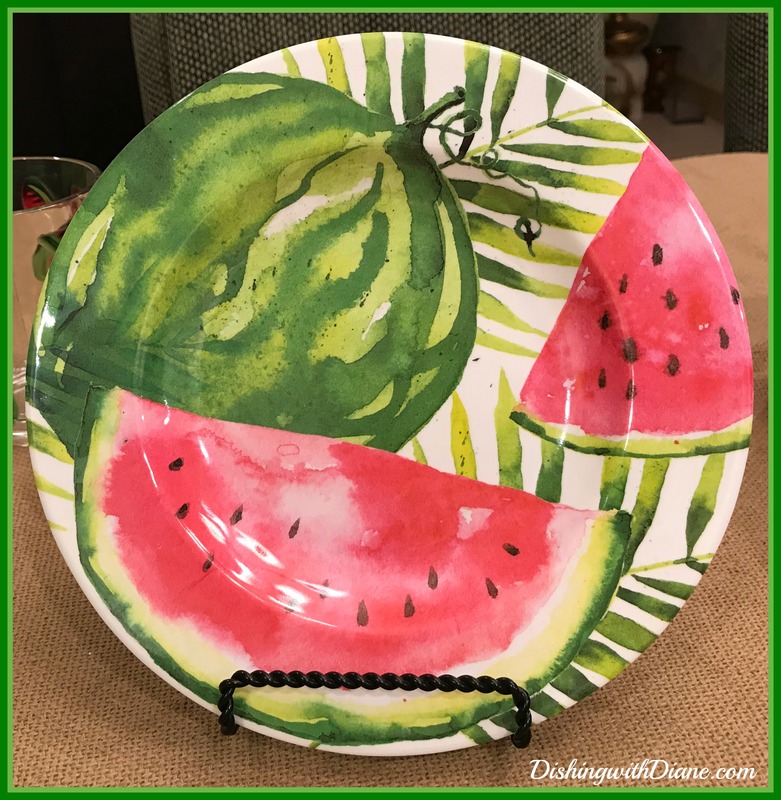 I will use this platter to serve watermelon slices. I have a few table accents in mind. 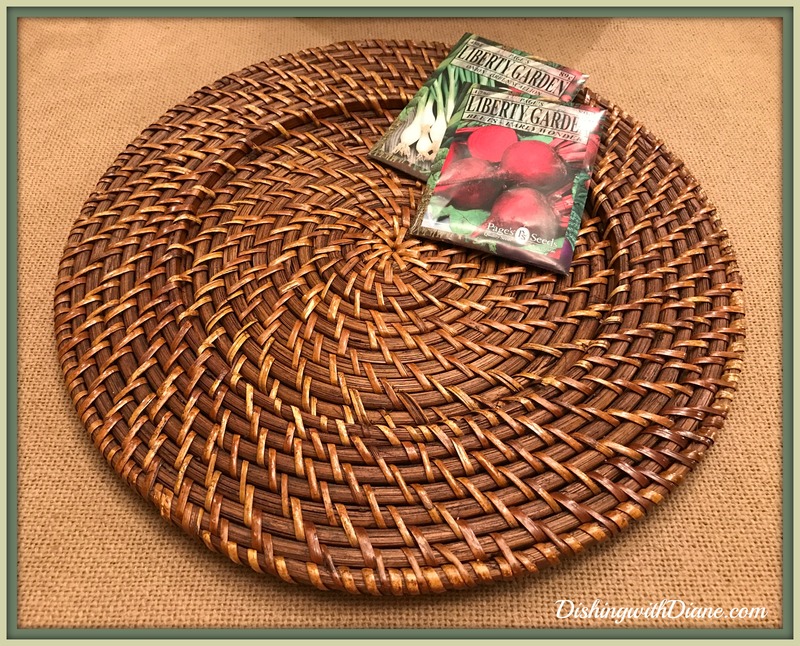 The first one is a coaster that I picked up in a tiny, I guess you could call it a general store (NOT Cracker Barrel) at a road stop on the way upstate to see our son. 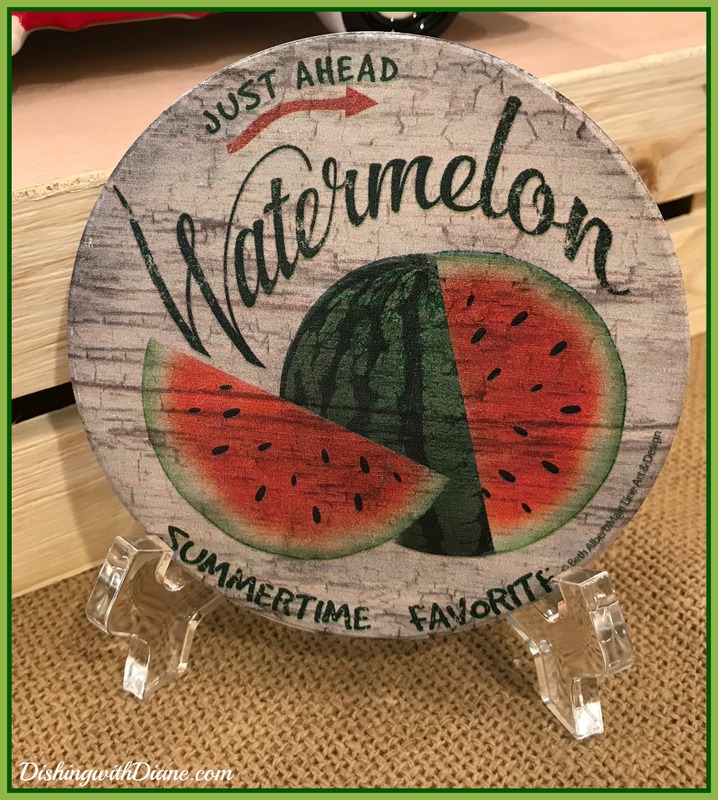 It is a coaster with a design of a watermelon with a slice cut out and the caption reads “Summertime Favorite”. They only had one, and I bought it anyway because it just struck me. Since this is all I have and it is small, I will display it on a clear acrylic easel as I would a photo on the table. My second table accent, (if you haven’t already guessed), is my favorite item for the tablescapes and that would be salt and pepper shakers. 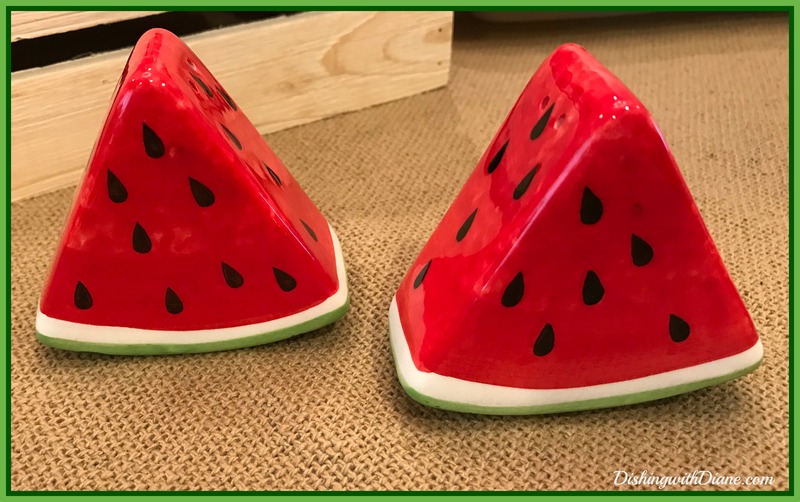 They are ceramic slices of watermelon in the true deep tone of real watermelon. A few years back, Kleenex introduced tissue boxes designed like fruits. 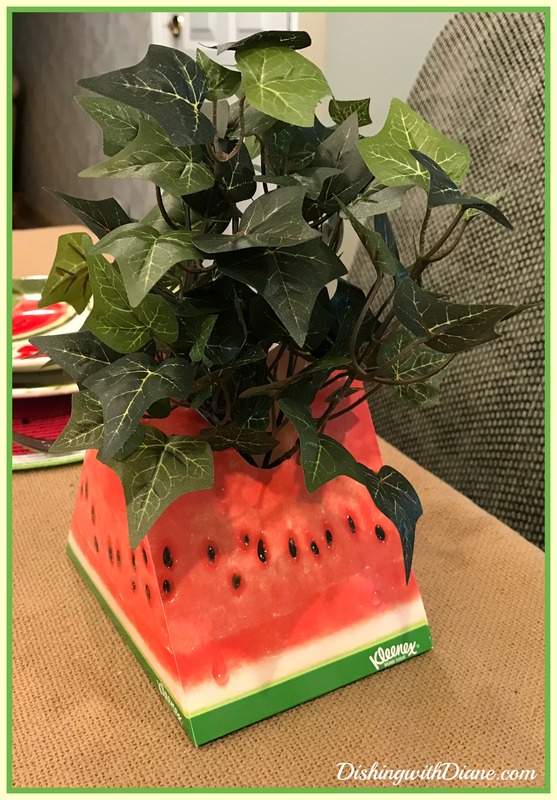 Of course I bought the watermelon box and I thought I could re-purpose it once the tissues were gone, so I filled the box with artificial greenery and use it as a display next to fruit platters at summer gatherings. Just like the Ferris Wheel from the “State Fair” post, I love conversation starters. And a vase of sunflowers in a mason jar with rocks. 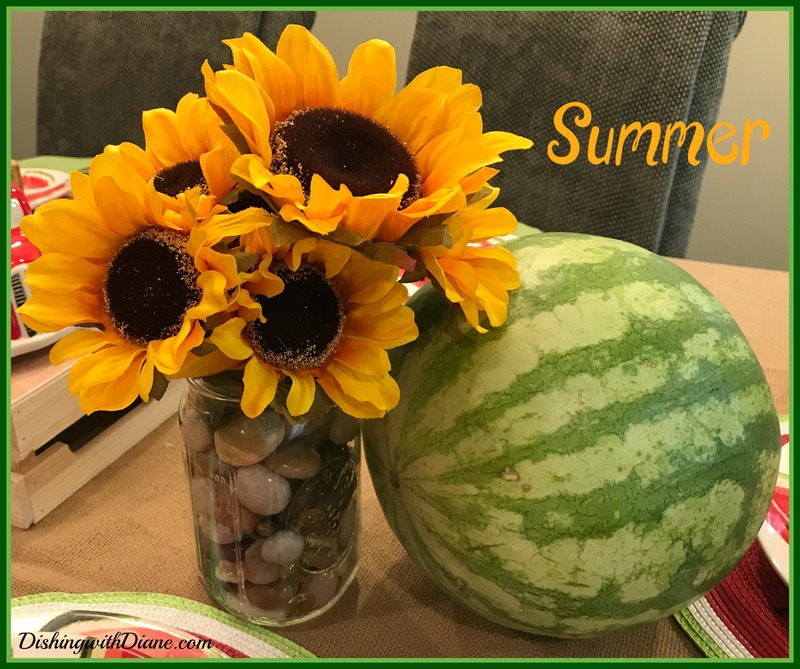 Sunflowers also scream “Summer” to me and this brings a pop of color to the table. 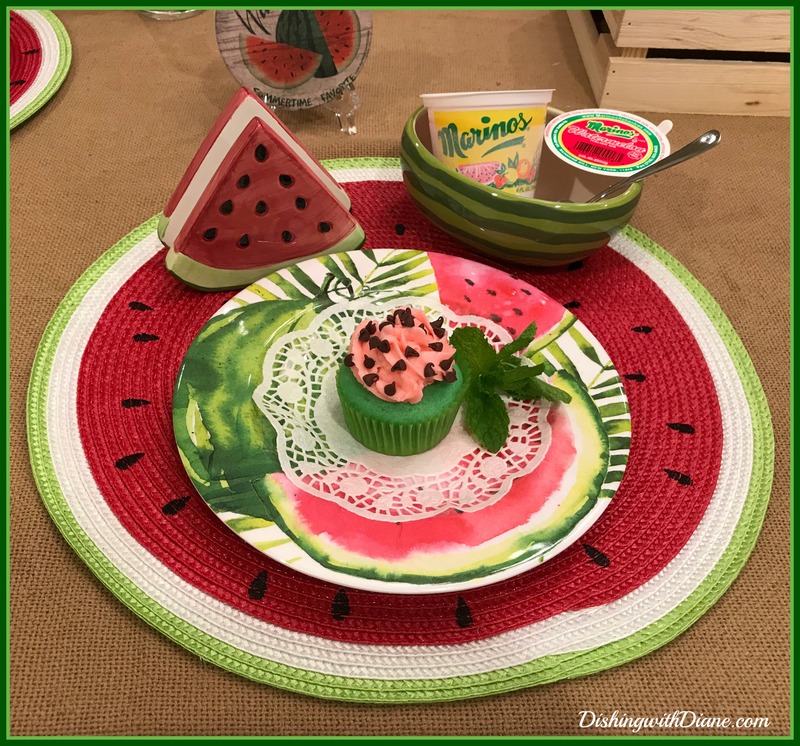 Now that the table is done…I wanted to make some watermelon “food items” along with slices of fresh watermelon and the first thing that came to my mind were watermelon cupcakes. (Do you see how my mind goes to dessert first)? 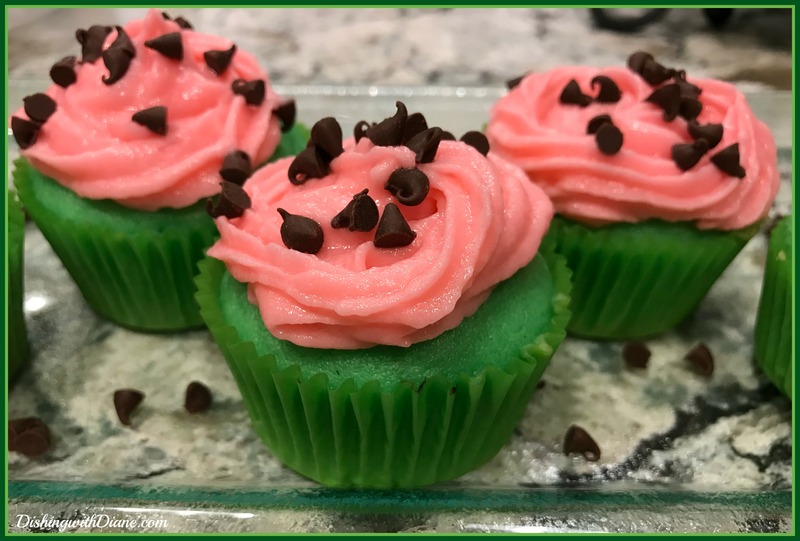 I love these cupcakes because they not only have the layered colors of a watermelon slice with seeds, but the buttercream frosting is watermelon flavored (thank you, Kool-Aid). They will look so cute on the table. 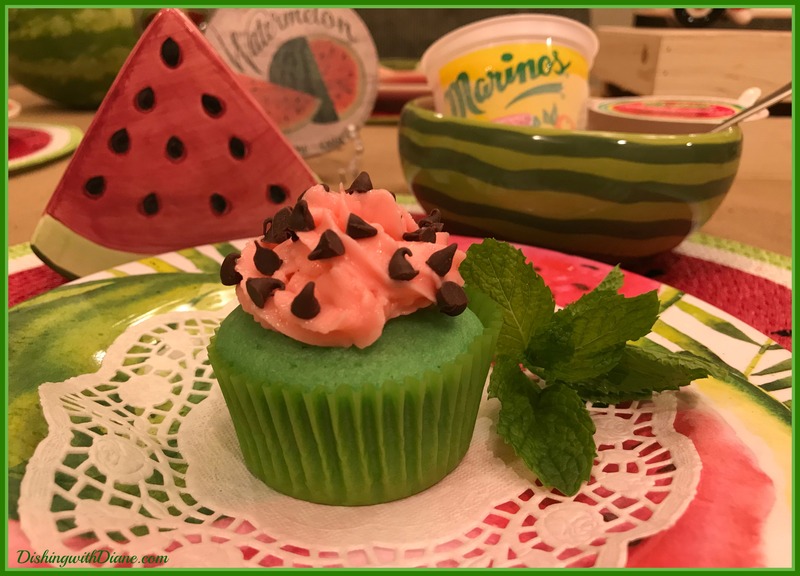 (Recipe for watermelon cupcakes at the end of the post). 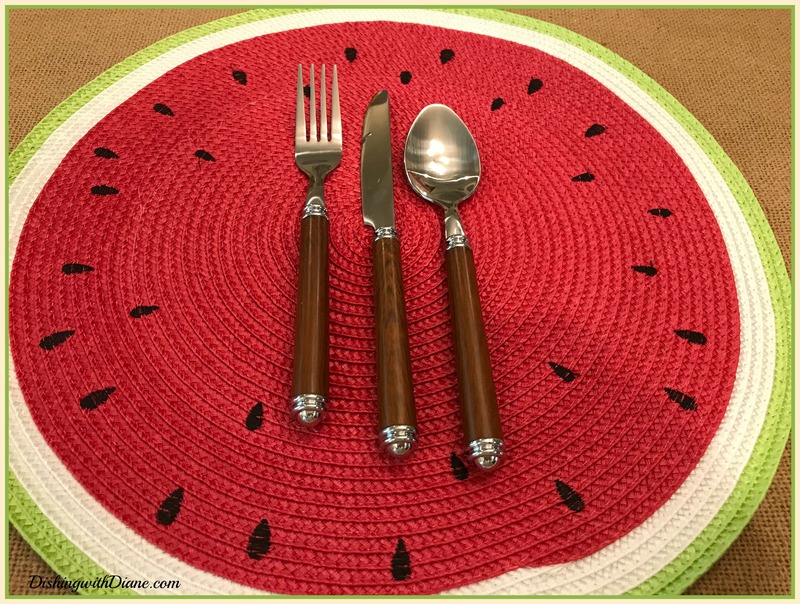 Well, now that I had a watermelon dessert, I might as well make a complete Goodbye to Summer Lunch with some watermelon tucked in here and there and some of my favorite summer foods. 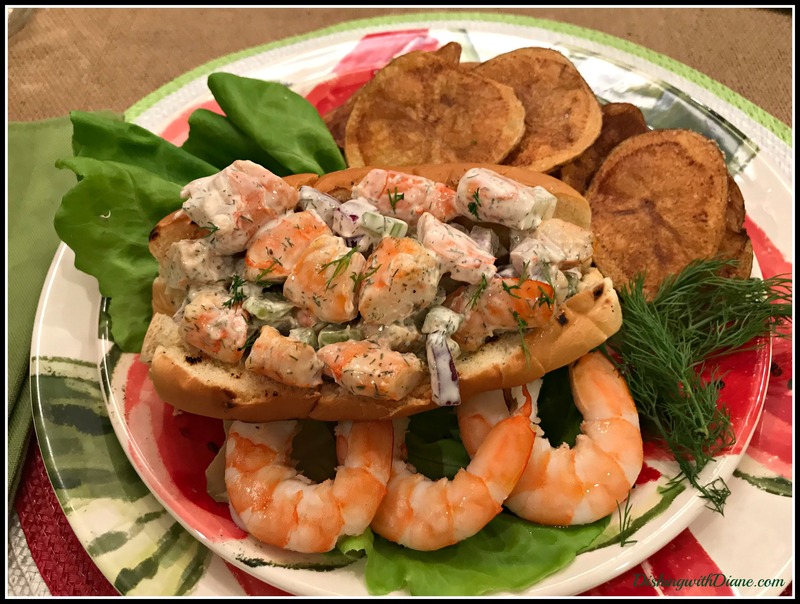 Shrimp salad roll – for those of us allergic to lobster. 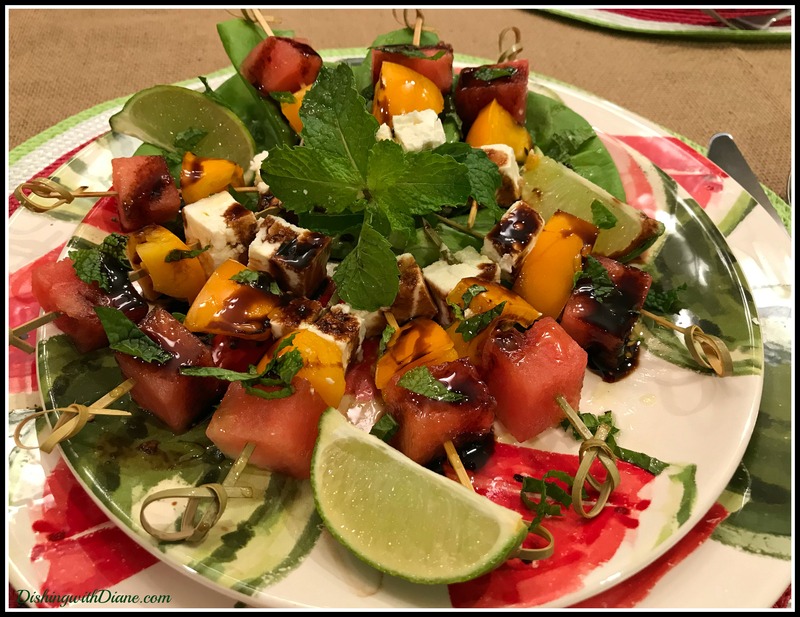 Tomato, Watermelon & Feta skewers with mint & lime. (recipe at the end of the post). Watermelon cooler made with lemon sorbet. 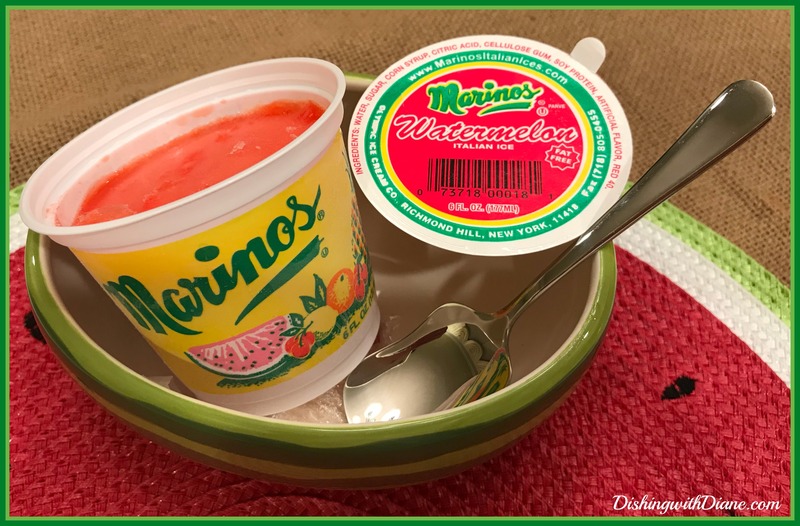 Watermelon Italian Ice (store bought). I could go on and make a watermelon cake, watermelon pizza and watermelon sorbet, but I don’t want to get carried away. Maybe next summer. NOTE: You won’t believe what I came across while looking for the Bellini recipe, a recipe for a “watermelon sandwich”. 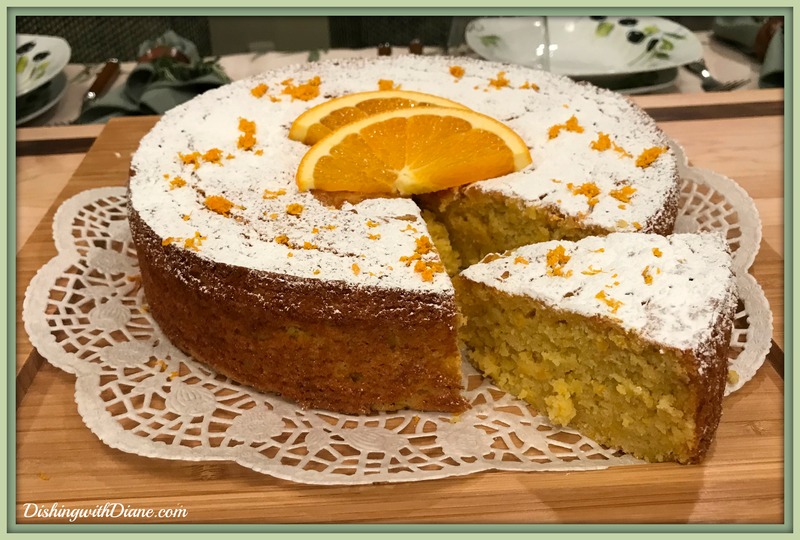 See the surprise recipe I found at the end of the post! Now my Goodbye to Summer lunch is ready. Bob and I will enjoy this lunch as I count the days until summer once again. (If anyone is interested, it is 272 days as of September 22, 2018). to the first day of Summer. 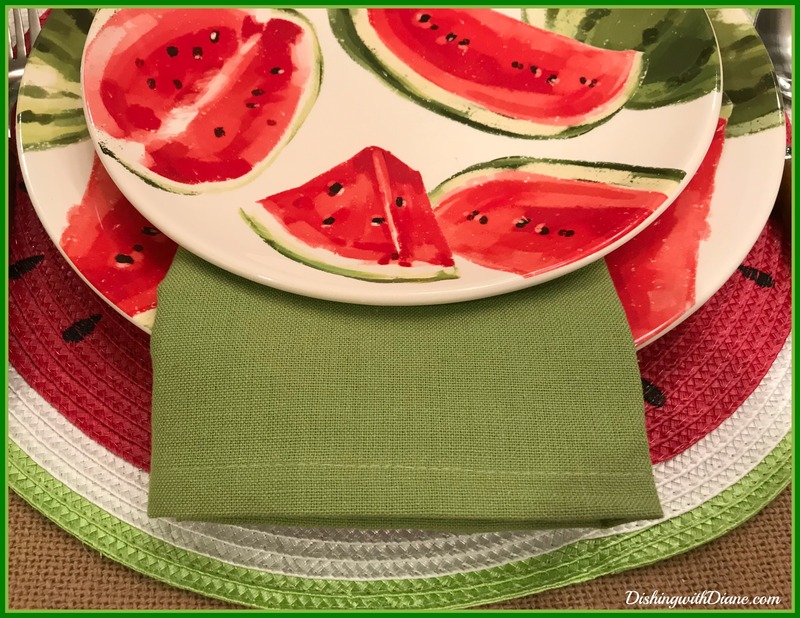 Thank you for visiting my blog and letting me share my Watermelon Tablescape with all of you. Until my next post, make everyday a celebration! 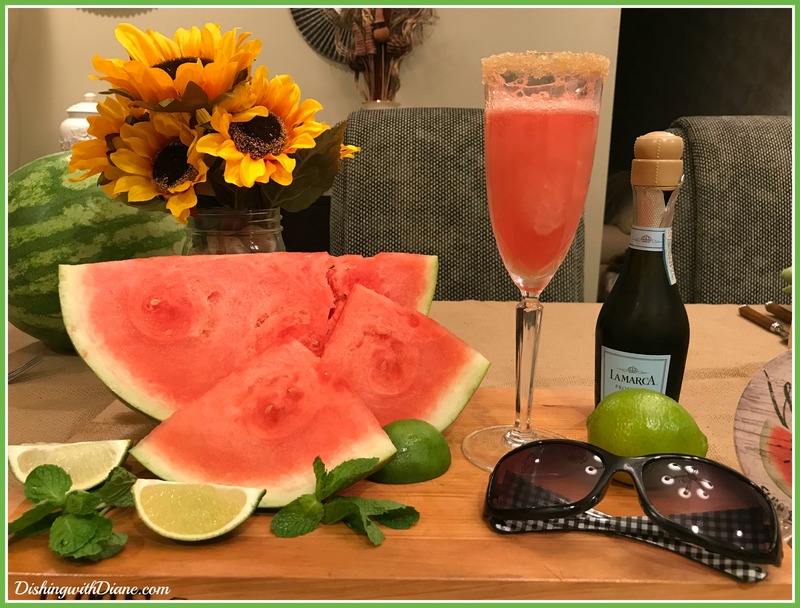 I decided to have a Watermelon Bellini after all, to send off Summer in style! 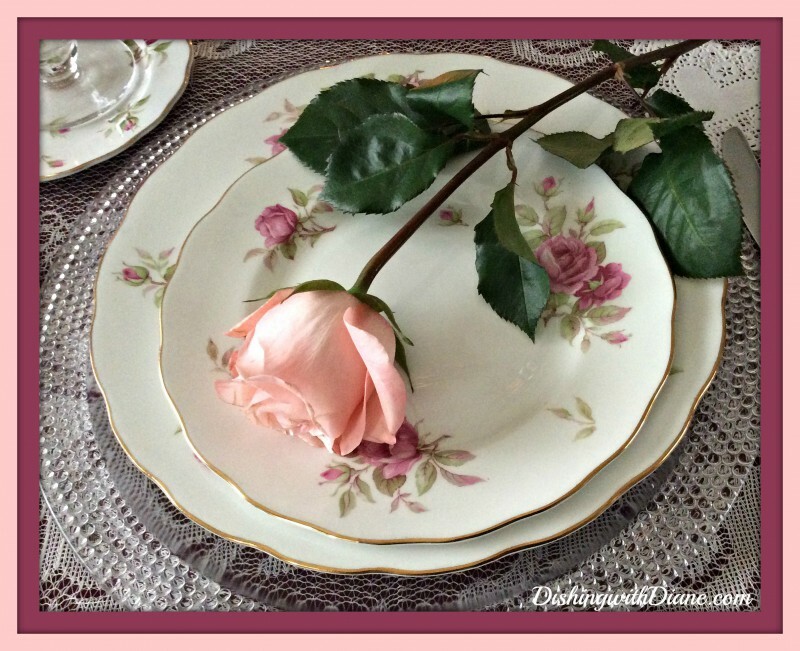 Ask your family and friends to join DishingwithDiane.com. and become part of the family! Once you become a member, you’ll never miss a post. Also, continue to send me your comments & emails, I LOVE hearing from you. Preheat the oven to 375º F. Place cupcakes liners to muffin pan. Add in the sour cream and vanilla extract, mix by hand with spatula. In a smaller bowl, combine the flour, baking powder and salt, gently mix with a spoon. Gradually add half of the flour mixture to the wet ingredients, do not dump it in, rather take spoonfuls of the flour mixture and gently shake it over the wet ingredients, as if you were sifting in the flour. Fold in the mixture until no flour remains. Repeat with the other half of the flour, folding it in and scraping the sides and bottom of the bowl to incorporate everything. Add in the green food coloring, mix to incorporate. Divide the batter among the cupcake liners, filling each 1/2 full. Bake at 375º F for 5 minutes, then reduce heat to 350º will keeping the cupcakes in the oven and bake for 8-10 minutes or until a toothpick comes out clean when inserted into the center of a cupcake. Allow the cupcakes to cool before adding the buttercream. In a mixing bowl beat the butter and vegetable shortening with an electric mixer until smooth, about 2 minutes. Add in 2 cups of powdered sugar, mix by hand with a spatula. Add in more powdered sugar as you see fit, up to 2 more cups, mixing first by hand then with an electric mixer. Add in the watermelon Kool-Aid powder and a small amount of red food coloring (to give the frosting a pinkish color), mixing one last time with an electric mixer. 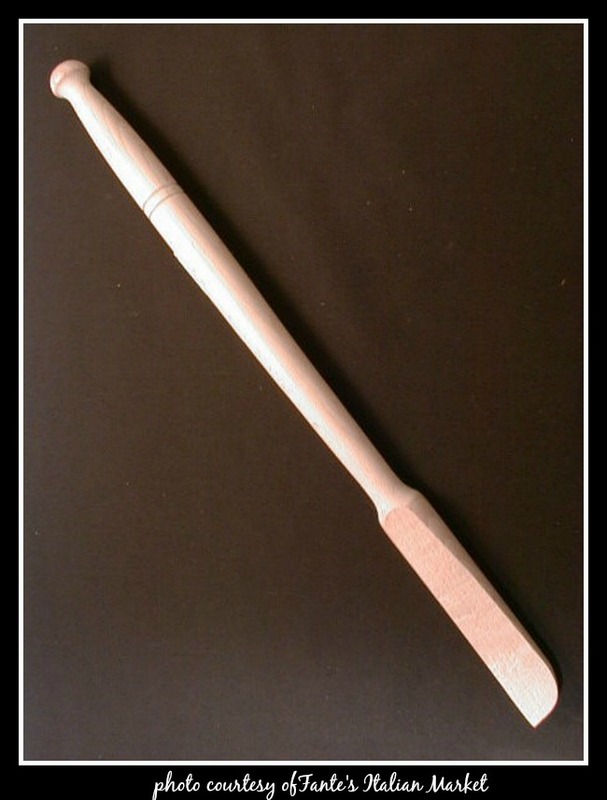 Place the buttercream in a large piping bag fit with a 1M Wilton piping tip. Push the buttercream down into the bag. Pipe the buttercream onto the cupcakes, starting in the center of the cupcake, swirling out, and then swirling back into the center, progressively stacking the frosting as you get to the center. Add mini chocolate chips on top of the buttercream. No time for skewers? Gently toss the ingredients in a salad bowl, or dice the tomato, watermelon, and cheese into small cubes to serve as a fresh relish for grilled meats. Boil 1-1/2 cups water in a medium saucepan and add shrimp. Reduce heat to medium and cook for 2-1/2 to 3 minutes, or until pink and just cooked (do not overcook). Drain shrimp in a colander and rinse with cold water and allow to cool. While shrimp are cooling, whisk together mayonnaise, lemon juice, dill weed and Old Bay Seasoning in a medium bowl. Cover and refrigerate until shrimp are ready to be added. Peel and devein shrimp and cut in half (or chop, depending upon preference). Add shrimp, red onions and celery and stir well to coat with mayonnaise mixture. Cover and refrigerate for at least 1 hour before serving. 1. Using a vegetable peeler or metal cheese slicer, cut potatoes into very thin slices. Place in a large bowl; add ice water and salt. Soak for 30 minutes. 2. Drain potatoes; place on paper towels and pat dry. In a small bowl, combine the garlic powder, celery salt and pepper; set aside. 3. In an electric skillet, heat 1-1/2 in. of oil to 375°. Fry potatoes in batches for 3-4 minutes or until golden brown, stirring frequently. 4. Remove with a slotted spoon; drain on paper towels. Immediately sprinkle with seasoning mixture. Store in an airtight container. In a food processor, blend watermelon, sorbet and lemon zest until very smooth. Stir in 1 1/2 cups cold water; cover and refrigerate until very cold. 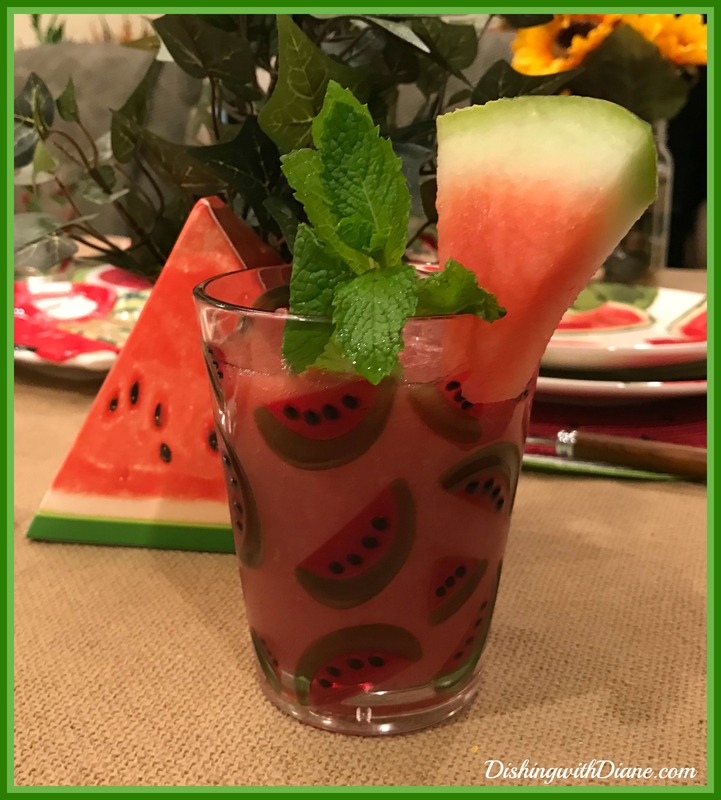 Serve over ice and garnish with watermelon wedges and mint. Cut lime in half. Cut 1 half into wedges, and rub on rims of 8 (6-oz.) cocktail glasses; dip rims in coarse sugar to coat. Process frozen watermelon, 1 cup chilled sparkling wine, sugar, salt, and juice from remaining lime half in a blender until smooth. Pour mixture into prepared glasses; top off with additional sparkling wine. Garnish, if desired. Serve immediately. **NOTE- Any summer melon will work. For a nonalcoholic option, replace the sparkling wine with sparkling white grape juice, sparkling cider, or club soda. Just had to share this, the surprise recipe I found. It looks as though I CAN have a Watermelon sandwich. Crumble chilled goat cheese into a small bowl. Lightly mix cheese and chopped mint. Taste for seasoning and adjust with salt and pepper. Cut bread into 8 small slices and drizzle with olive oil. Toast bread slices until golden brown and crispy on top. Let bread cool slightly. Spread cheese mixture on the top of each slice of bread. 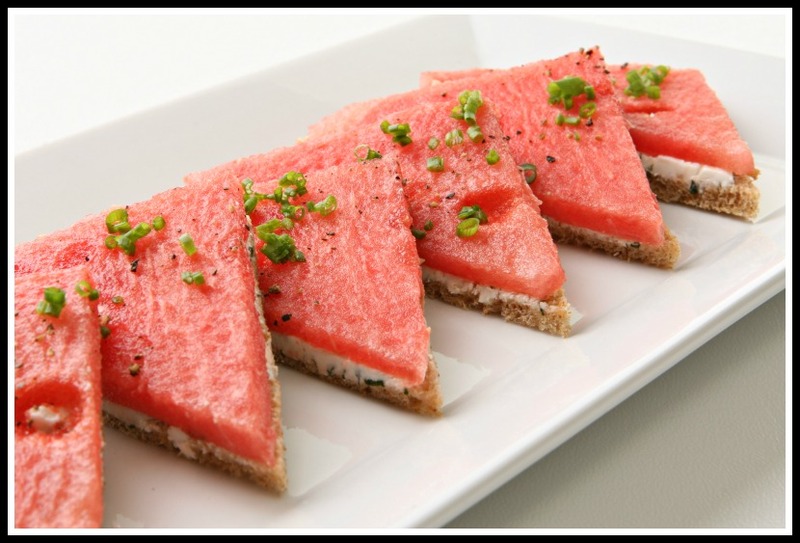 Cut watermelon slices into fun shapes and layer watermelon on top of cheese. Lightly season the top of the sandwiches with salt and pepper. Serve at room temperature. This entry was posted in Desserts, Salads, Seafood, Vegetables on September 22, 2018 by aries041158. Click on the photo to enlarge and then the back arrow to return to original size. I have to share this recipe with you. Whenever I am invited to a barbecue, everyone asks me to bring the same thing- my potato salad. 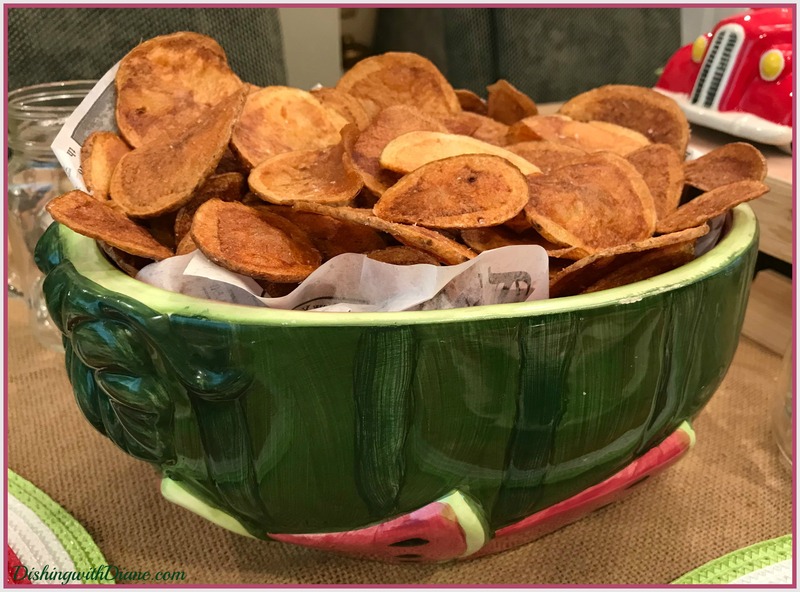 This has to be the easiest recipe around and it is always a crowd pleaser, so I wanted to share this with all of my members. 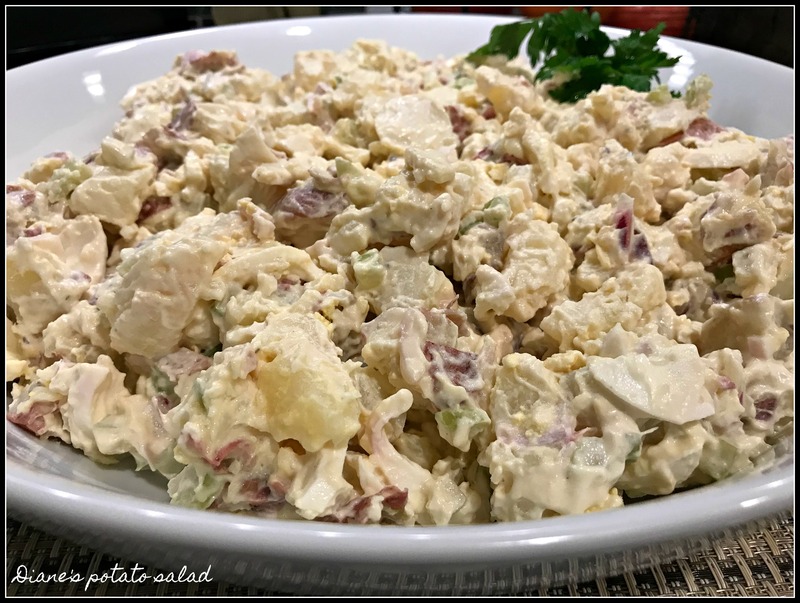 I have been making this potato salad over 20 years and I don’t remember where I got the original recipe from. Of course, I have tweaked it a little here and there over the years (I couldn’t help myself). In my house, we have made it a tradition that this potato salad does not make an appearance until the 4th of July. After that, I make it the rest of the summer. The recipe calls for 1 dz. hard boiled eggs, so make sure you check your eggs for freshness. Check your eggs for signs of cracks. Since fresh eggs are harder to peel it is best if you purchase your eggs a week prior to boiling. You can test the freshness of the eggs by placing them into a glass of water. The freshest eggs will lie on the bottom of the water on its side. As an egg ages the air pocket inside grows so your egg will start to stand up on end. An egg that floats to the top should be discarded. If you try this recipe, PLEASE let me know what you think. Mix mayo and vinegar together—Add salt, pepper, and sugar and mix thoroughly. Add eggs (sliced) and fold all ingredients together. (Best when chilled in the refrigerator for a few hours). If you enjoy the posts, please spread the word and ask your family and friends to become members of DishingwithDiane. Also, continue to send me your comments and emails, I LOVE hearing from you. This entry was posted in Salads, Side Dishes on July 28, 2018 by aries041158. 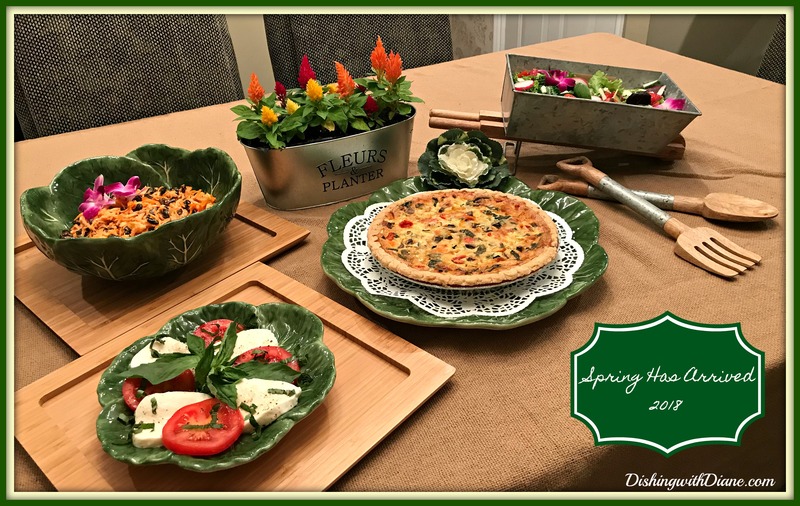 I have been very, very busy the past few weeks so instead of sharing a tablescape today, I wanted to share some springtime recipes with all of you. Spring has finally arrived here in the Northeast and it is glorious to finally have some nice weather. Spring makes me want to open all the windows and welcome in the fresh air. What a pleasure! I am waiting for all the farmers markets and road stands to open. 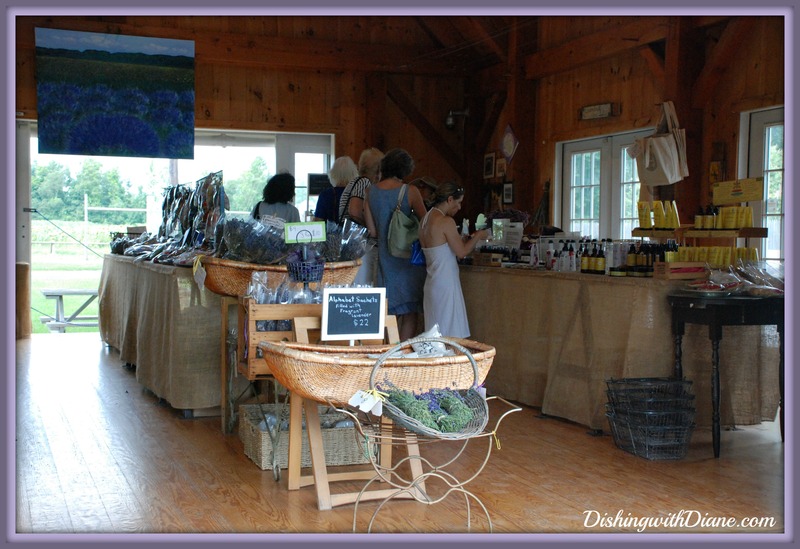 I love going to farm stands and buying fresh produce straight from the fields. Fresh is best and I want to support the local farmers. I also buy all my organic herb plants from the farms. This year I am growing a larger herb garden than last year because it seems that I am constantly buying herbs in the grocery store only to have them last a few short days. Last year we planted basil and parsley but this year I am branching out to add rosemary, sage and thyme. As we all know I have a brown thumb (I killed the bamboo), so Bob will have to take over the garden. I will still be the chef. To welcome spring and this lovely weather for the past few days, I decided to make a quick weeknight “Springtime Buffet” for Bob and I with some fresh veggies. Nothing fancy, just an ordinary night. (Once you read the recipes, you will notice that they are all fairly easy). 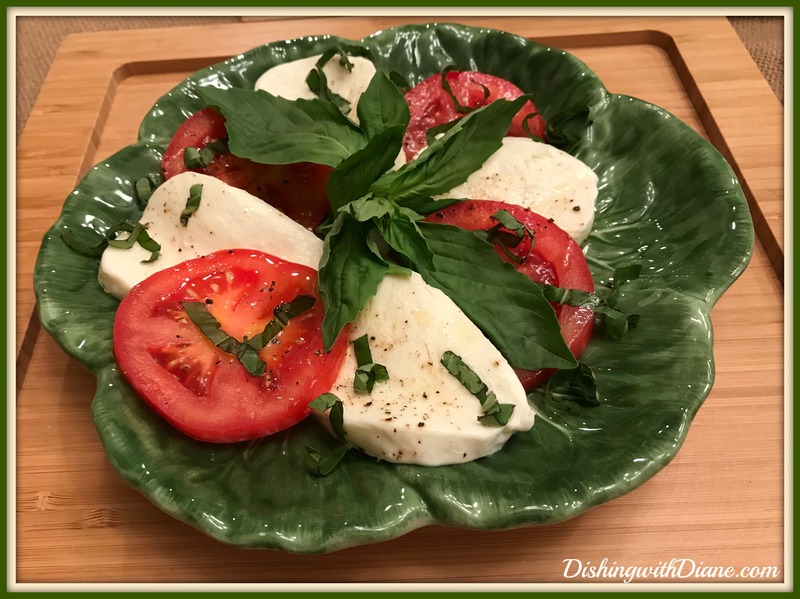 I started with one of my favorite salads, an Italian caprese salad which is layers of alternating tomato slices with fresh mozzarella, basil, some olive oil and seasoned lightly with salt and pepper. I have this salad all spring and summer. 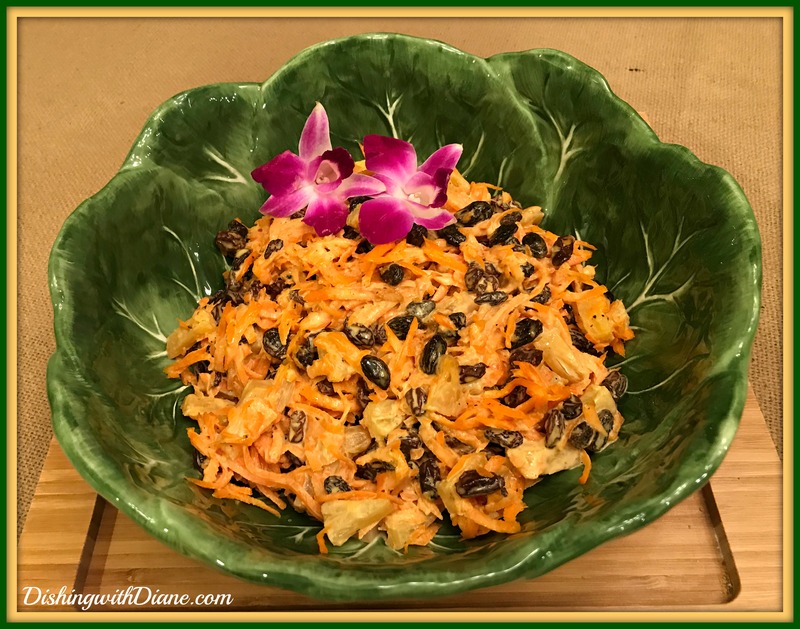 I made two additional salads for the table, one is a very refreshing carrot salad with pineapples and raisins. I have been making this four ingredient salad for years. I can’t even remember where I got the recipe from. When I visit my son, I have to remember to bring a container of carrot salad because it has always been a favorite of his. The secret is using fresh topped carrots and not the carrots pre-packaged in bags. Fresh carrots are so much sweeter. The second salad was a tossed salad of mixed greens with the addition of radishes, cucumbers, fruit, nuts and cheese. I make my own salad dressing with lemon juice, mustard, mayonnaise, garlic & oil and I will include that recipe at the end of the post. It is officially spring when I start using one of my favorite pieces for spring and summer. A galvanized wheelbarrow that I use for salad. Purchased last year in my home away from home, Pier 1. It just puts me in the mood for gardening and springtime. The main entree for this buffet was a vegetable quiche. 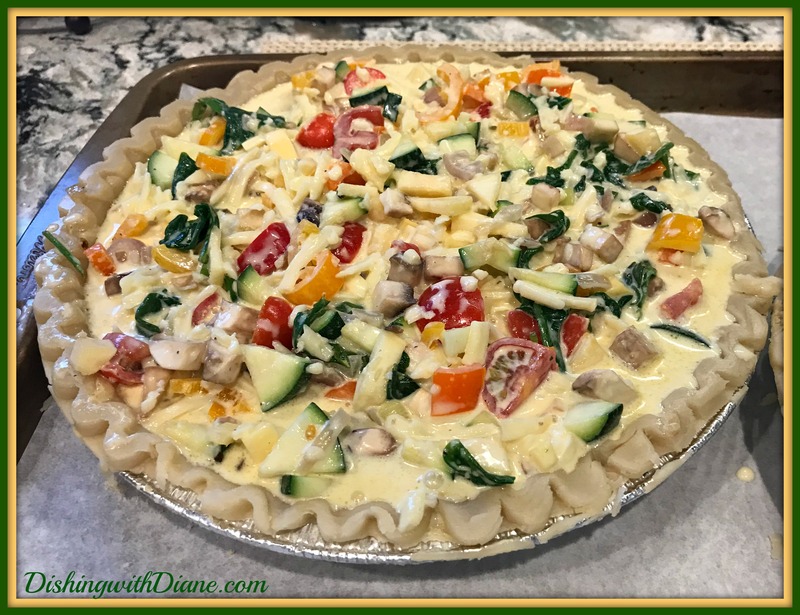 The quiche was filled with yellow squash, green zucchini, peppers, tomatoes, mushrooms and spinach. You can add any combination of veggies you want as long as you use the basic recipe. I change the filling all the time depending on what I have in the veggie bin. I did not have enough time to “attempt” to make my own pie crust ( making homemade pie crust is not my specialty), so I used a frozen organic pie crust. I always sprinkle a layer of fine bread crumbs on the bottom of the pie crust just in case your filling is too wet (the mushrooms give off liquid). The bread crumbs will prevent the crust from getting soggy. 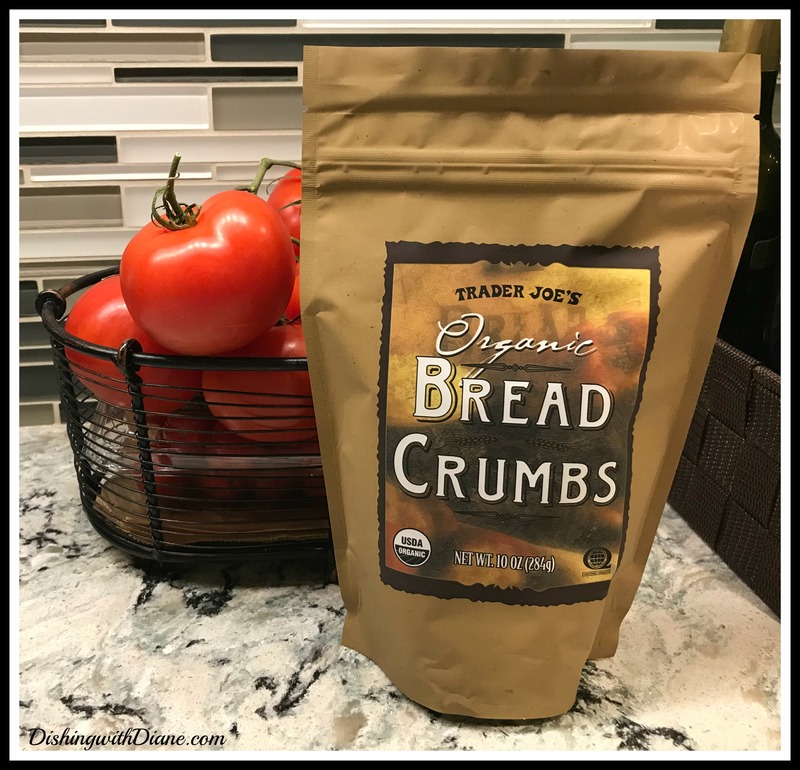 I find the best bread crumbs for this job are the organic bread crumbs from Trader Joe’s because they are extra fine. Once our springtime buffet was complete, we enjoyed eating this meal outside on the patio. I just love when we can dine al fresco. I hope that some of the recipes today inspired you to try something new. Give them a try and find a new favorite, and enjoy the nice weather too! 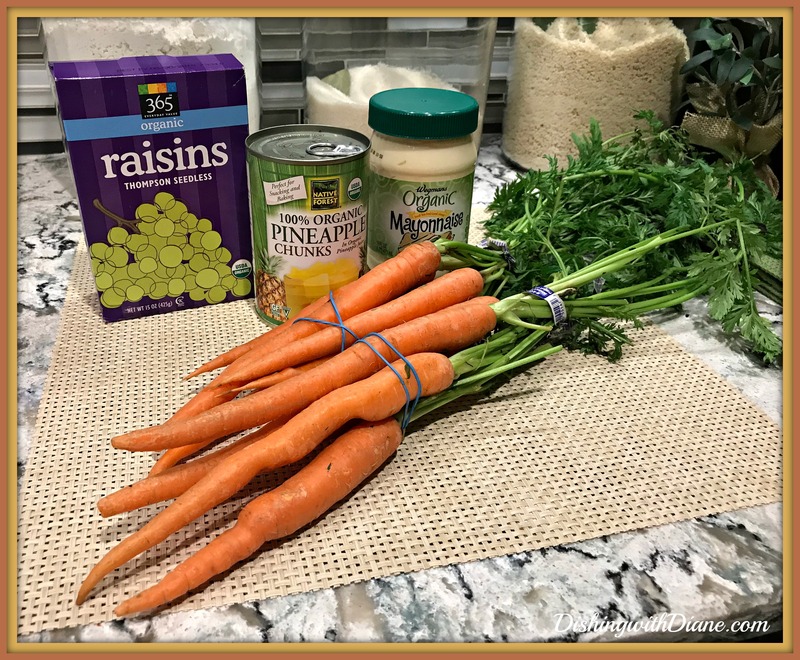 Place the carrots in a large bowl and add the mayonnaise, pineapple, raisins, salt & pepper. Toss well and season to taste. Serve chilled or at room temp. 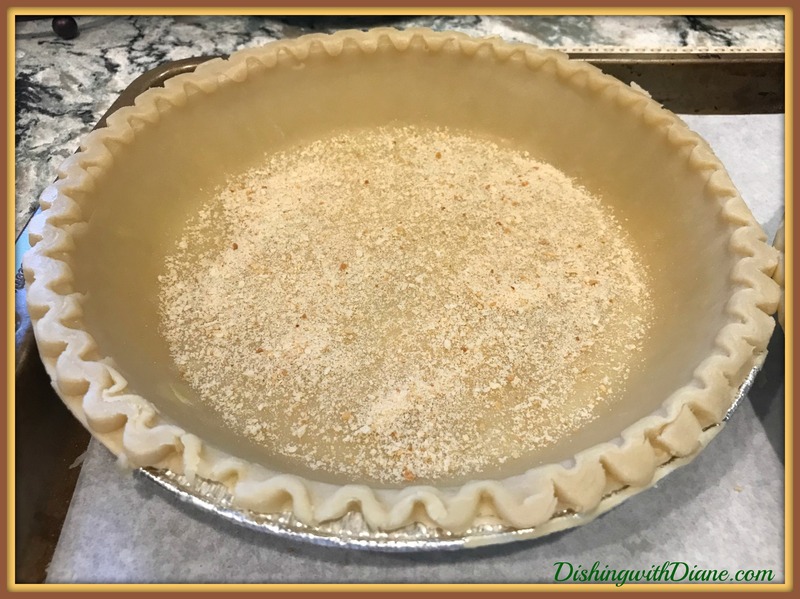 COOKS NOTE: I sprinkle a layer of fine breadcrumbs on the bottom of the pie crust in case your filling is too wet, it will prevent the crust from getting soggy. COOKS NOTE: if you add spinach, buy frozen it’s easier…thaw and squeeze out excess water. Break apart the spinach and add to the ingredients. Hand whip eggs, half-and-half, mayonnaise, and flour in a medium-mixing bowl. Add the remaining ingredients. Pour into an unbaked 9-inch, deep-dish piecrust. Bake for 45 minutes to 1 hour 15 minutes or until top is golden brown. Also, continue to send me your emails and comments, I LOVE hearing from you. 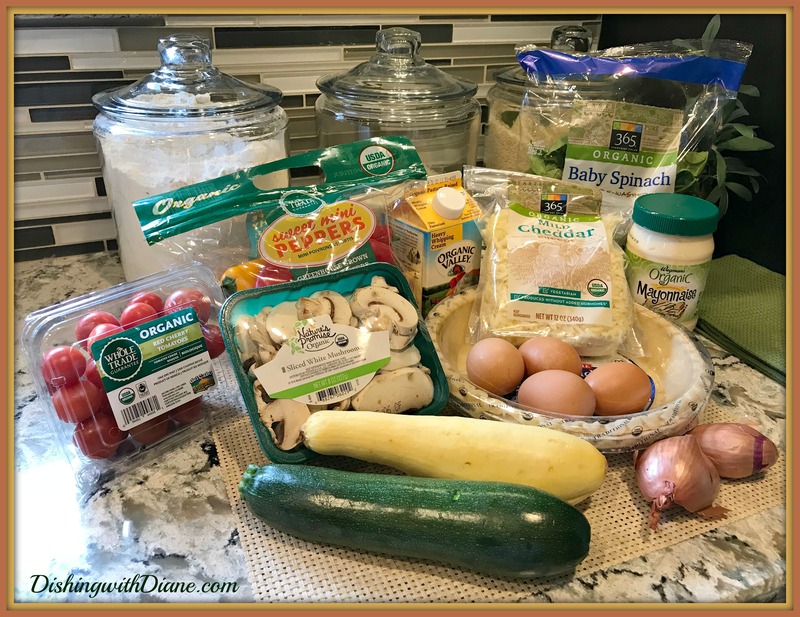 This entry was posted in Quiche, Salad Dressings, Salads on May 12, 2018 by aries041158. I have been away from posting for quite a while and missed all of you. I was away because I had a lot of things going on at once. I had a wonderful few weeks with my son who was visiting during his vacation. We had a great time and we were out and about every day and I had no time to post. For my husband and I, having our son home makes our home complete. 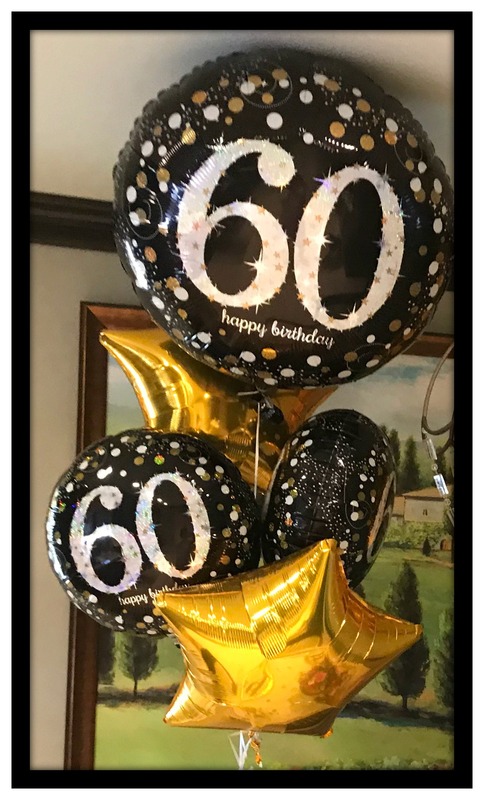 Also during my absence, I celebrated a milestone birthday and turned 60-years old! I don’t know where the years have gone and it seems the older I get, the quicker the years pass but I am very happy to celebrate this milestone birthday. My son was still home and having him celebrate my birthday with me was the best gift I could have ever received. I apologize to those who wrote and wanted a new Easter tablescape. I promise you, you will have one next year. And I want to thank those who sent e-mails to see if I was okay when I hadn’t posted. I was overwhelmed by your thoughtfulness. The name of this post is “Memories of Grandma’s Polenta Nights”. Some of you who have been members since DishingwithDiane began three years ago will remember the story I told about my grandmother and eating polenta with mushroom sauce off of her special pastry board. When Grandma called for “polenta night”, you dropped everything and headed over to her house. No questions asked and there were no excuses not to show up. It was as sacred as going to church, you couldn’t miss it. Not too long ago, I went to lunch with some of my friends and we were talking about family traditions and I mentioned eating polenta off the board at Grandma’s house. Some of my friends remembered the earlier post and some never heard the story. For those of you who are not familiar, Polenta is cornmeal. Sort of like “Italian grits”. The original polenta was cooked stove top, low and SLOW. And I mean slow. I remember my grandmother and Mom mixing the polenta in simmering water and salt for close to 45 minutes, then adding grated cheese and butter once it became thick and creamy. Grandma even had a special spoon to turn the polenta and when I see this spoon in Italian specialty shops, it always makes me smile. (A polenta spoon can be purchased online at Fante’s Italian Market if interested. Their website is always fun to browse). Thank God polenta now comes in an instant version that you only need to stir for less than 5 minutes, so I never bought myself the polenta spoon. 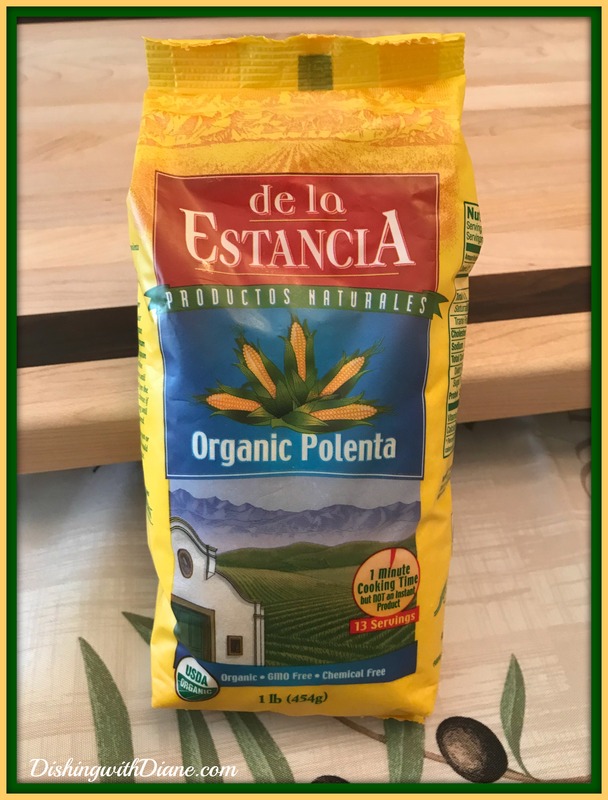 I find the best polenta to be “de la Estancia” brand. Organic and “not gritty” at all, very creamy. As I said before, when Grandma called and said it was “polenta night”, everyone went over. 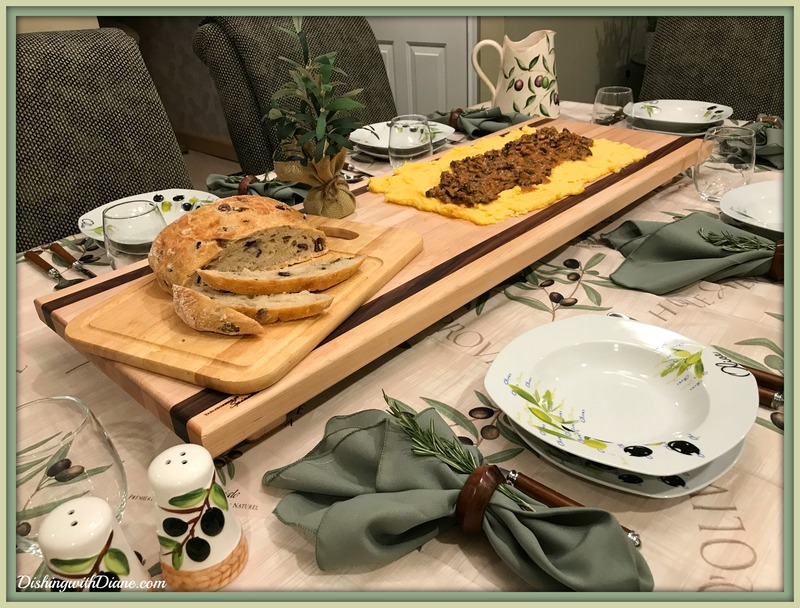 Her wooden polenta board made a grand appearance at the table. It was huge and spanned the entire table. She had it stored all wrapped up in a clean bed sheet in her hallway closet. And after every use it was washed and oiled before putting it away for the next polenta night. 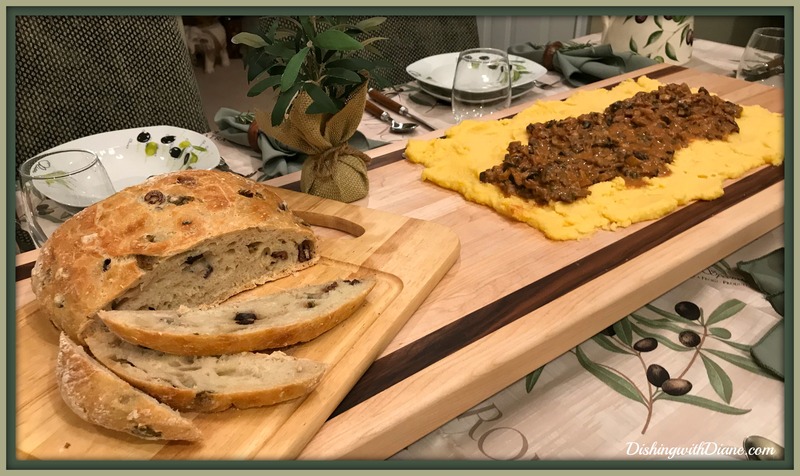 We all sat around the board at the dining room table and Grandma would spread the hot polenta out of her saucepan onto the board and top it with her famous mushroom sauce (very thick, almost like a Bolognese) and grated cheese. Everyone picked their spot and started to eat and talk and talk and talk. As with any Italian family there was more than one conversation going on at a time- we got used to jumping in and out of conversations. Polenta starts to get hard around the edges at room temperature and that was always the time that my cousins and I wanted to become creative and make a design in the polenta. I can’t tell you how many times we ate the polenta with the goal of making it look like the boot of Italy – never happened. If Grandma had company for dinner outside the immediate family, she served the polenta in bowls with her sauce. Not nearly as much fun. So after strolling down memory lane at the diner with my friends, I decided to make them polenta on the board so they could experience it first hand. Of course, I will set a place setting with bowls in case eating off the board is not what they had in mind. I am serving the polenta with a favorite salad of mine, that both my grandmother and mother made all the time. 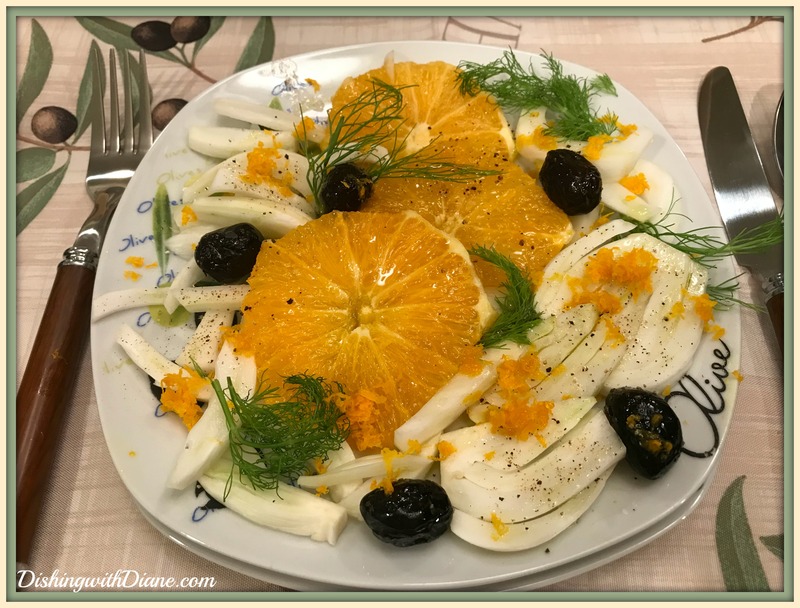 It is so simple, delicious and refreshing – Orange and Fennel Salad. Salad was always served in my house after the main meal, so I will be following that tradition with this luncheon as well. My grandmother served fennel at the end of every meal (especially holidays) to aid with digestion, because God forbid you had heartburn or felt bloated after one of her meals, she would be insulted. I add some fennel fronds and orange zest before serving for garnish. (olives & sliced red onion are optional). 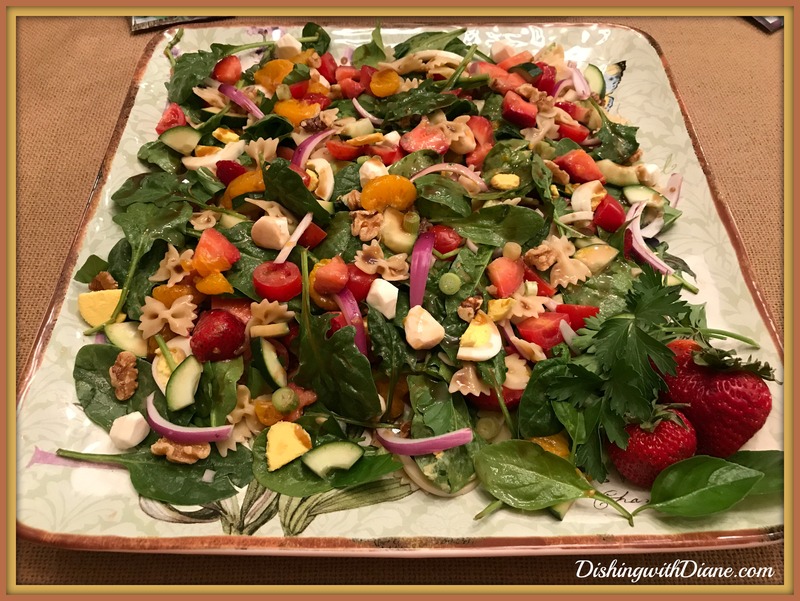 I don’t really have a specific recipe for this salad since I just toss it together, so I am printing the recipe at the end of the post from the website Memorie di Angelina with their link if you want to see step by step instructions with photos. 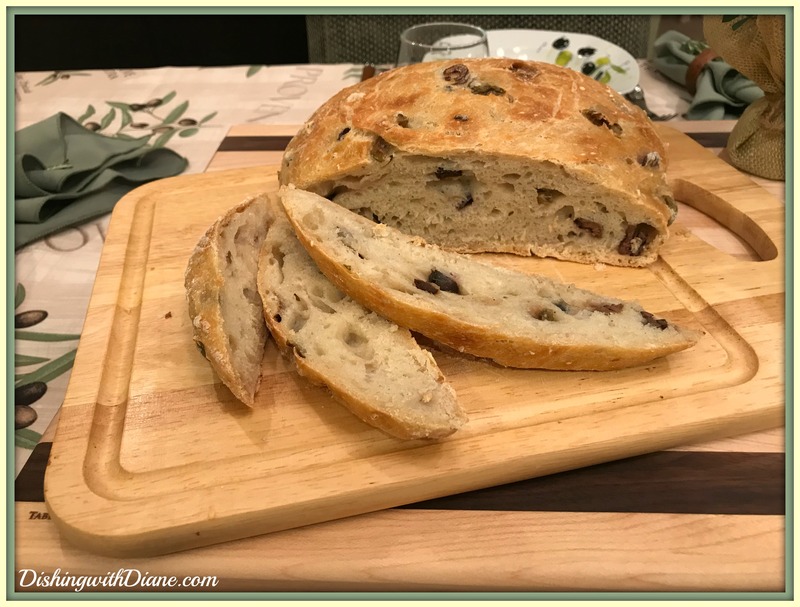 Every Italian meal has bread and I will serve this meal with homemade olive bread. Yes, I said homemade. We all know, I am not the baker but I am going to give this a try. 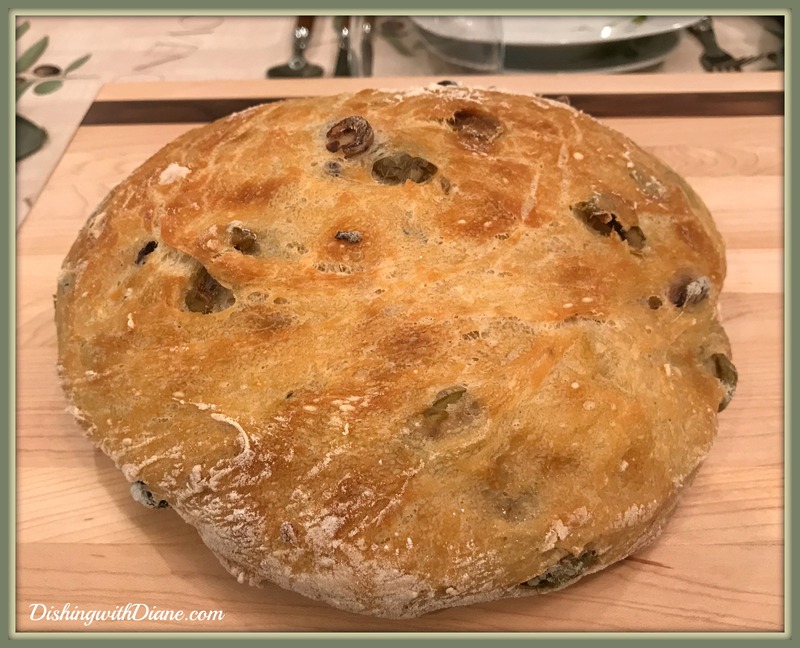 I have to use the no knead bread recipe because homemade dough and I are not best friends – I added kalamata olives. Usually I tell my guests what I am serving for a lunch in case there are food allergy concerns but this is a “surprise lunch” and I have other lunch options on stand by. I made my version of polenta with Grandma’s mushroom sauce, but I added hot sausage for a little kick. While purchasing all the ingredients for this luncheon, I was basking in the memories the polenta brought back to me. The days when all my family was still with us and we were laughing and eating. Polenta, which was once thought of as a peasant meal, has now become quite popular in Italian restaurants. I hope you try this recipe (with the instant polenta) and enjoy. If you have any leftover polenta from the saucepan, spread it out onto parchment paper in a jelly roll pan as flat as possible. Once the polenta has hardened, cut rounds out of the polenta (with a wine glass or cookie cutter) and save them wrapped in wax paper in a container in the refrigerator. Perfect for any leftover sauce. You can refrigerate for up to 5 days or store frozen for up to 3 months. Fry the polenta slices the next morning in a 1/2 cup of olive oil in a large skillet on both sides until golden. Drain on paper towels. Add a fried egg and you now have a polenta breakfast. Since my last post about polenta three years ago, I have purchased my very own polenta board. (How I wish I had my grandmothers. I don’t know what happened to that.) and I have polenta night on occasion and think of Grandma. 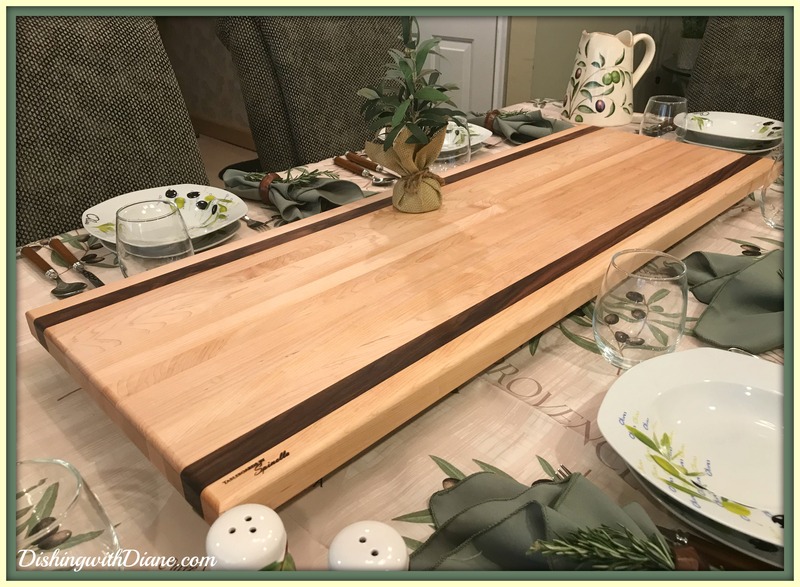 My polenta board is actually made to serve pizza but I have adapted it for polenta and it is also great to add some extra height to a buffet table. If you decide to have a polenta dinner party with friends, make different sauces in addition to the mushroom sauce. You could have marinara or pesto sauce if your guests want a lighter sauce. The mushroom / sausage sauce is a bit heavy. I want this tablescape to feel as if I was eating at a farmhouse in the hills of Tuscany. 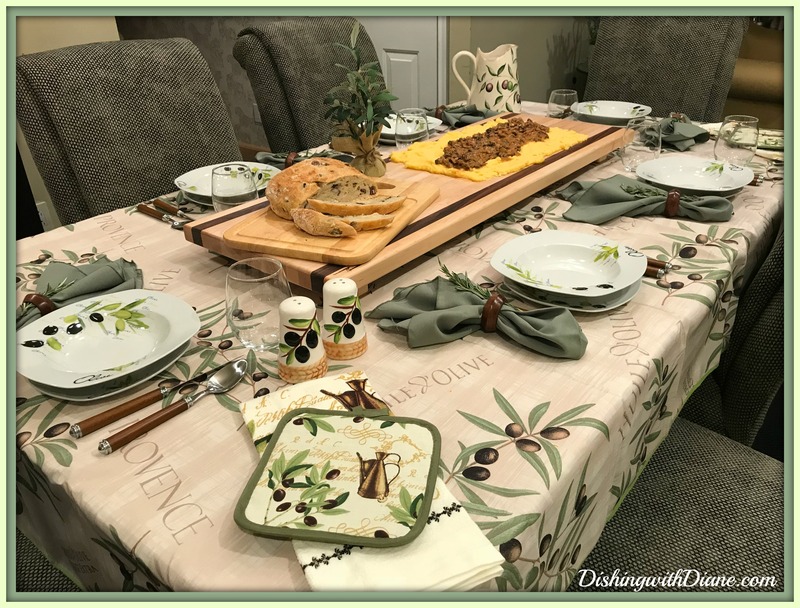 I am sure that it would be just a picnic table I would be eating on but I decided to start with one of my favorite tablecloths. 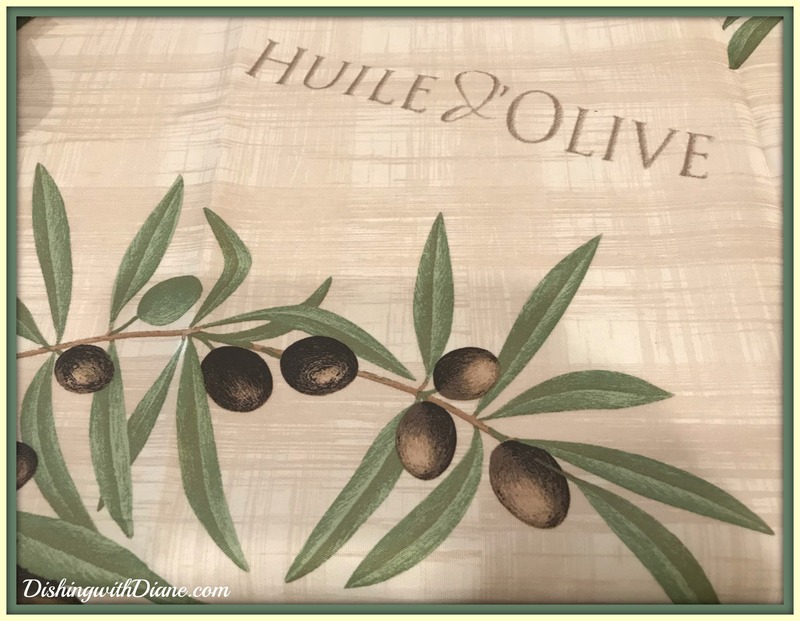 I am using a cream tablecloth with an olive branch design to transport us back to Italy. 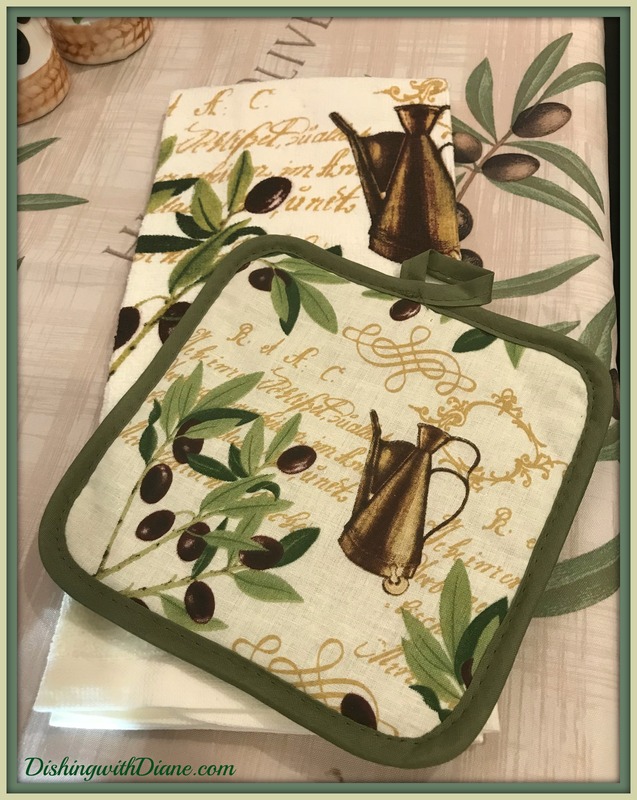 I love anything with this design and I think that is one of the main reasons my kitchen has a Mediterranean theme. 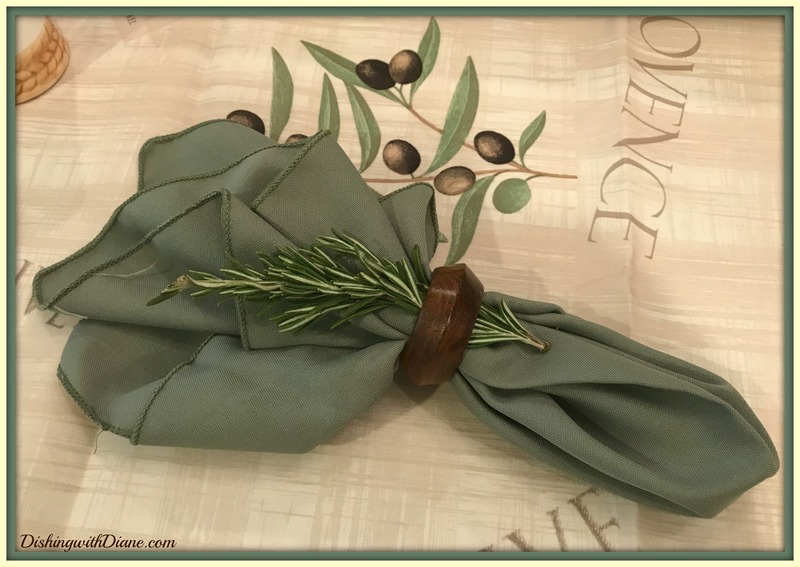 The napkins are olive green and I am using wooden napkin rings with a sprig of fresh rosemary for an earthy touch. Here is something new for me, NO placemats or chargers for this rustic table. Just a salad dish and a pasta bowl. Pasta bowl for the polenta if you’re not ready to eat off the board and a salad dish to enjoy my salad at the end of the meal. I wanted to make this meal exactly as Grandma did. 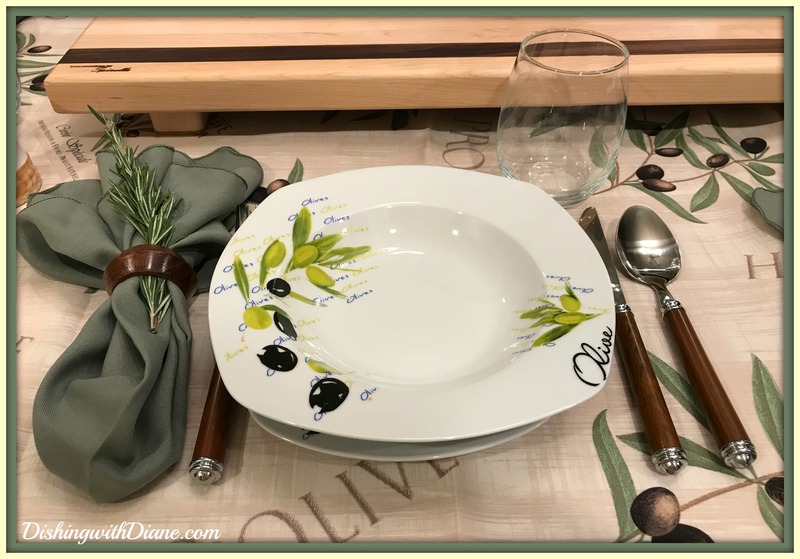 I do have the perfect dishes for this tablescape…It is very rare for me to purchase a square plate, but I saw these dishes and knew they would be a perfect addition to my Mediterranean kitchen. 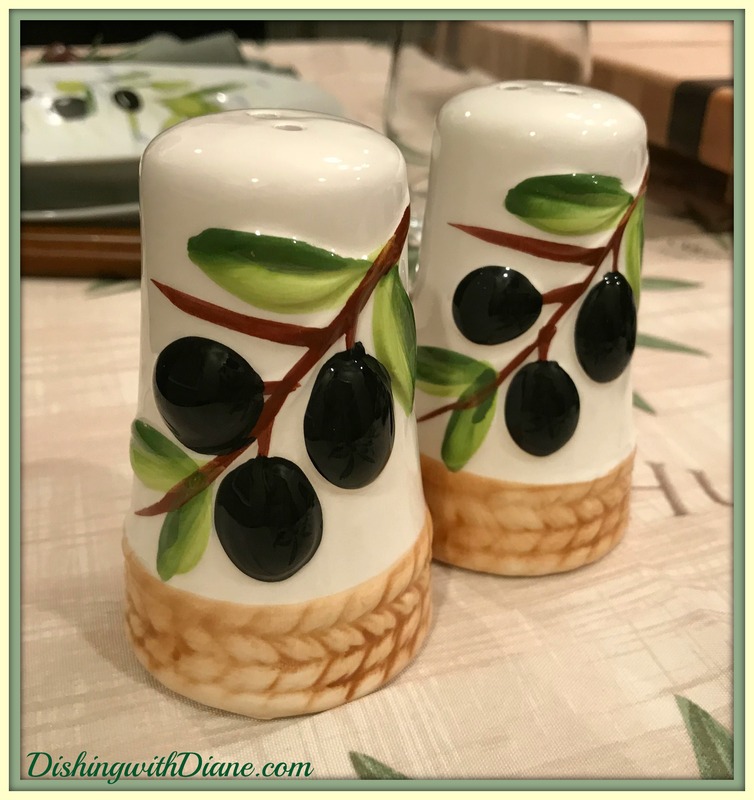 The dishes are cream porcelain with a pattern of green and black olives. 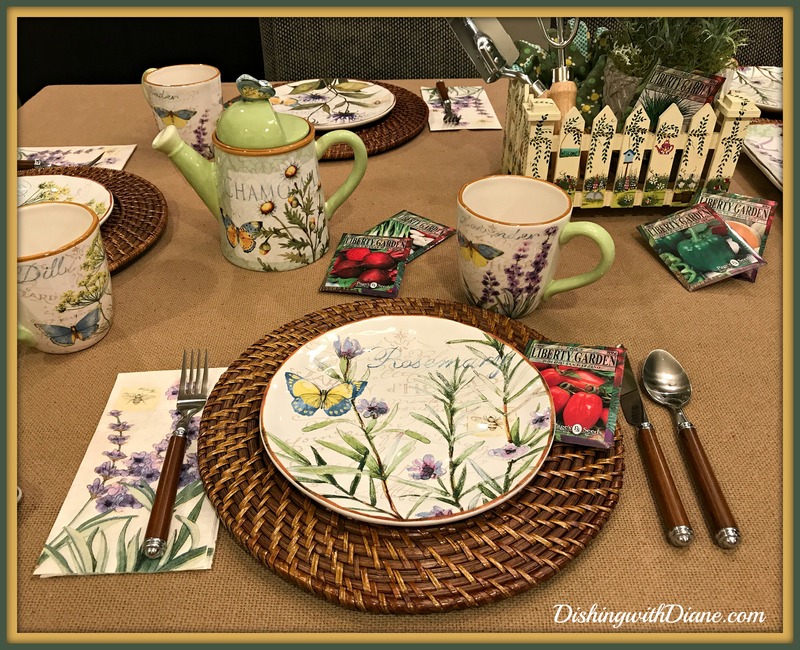 The pattern is part of the “Olive Branch” Dinnerware Collection and is manufactured by Lorren Home Trends. As an added bonus, the dishes are both microwave & dishwasher safe. My only complaint with the set, is that the coffee cups are the size of demitasse cups and nothing you could use for morning coffee. and my glassware will be clear stemless wine glasses. And now for the star of the show…the polenta board. It also doubles as my centerpiece. I just love this board. I found it while getting in some retail therapy and searching Google for a polenta board. (I do my best shopping online late at night). Before I used it, I washed it with a damp cloth and then oiled it with food grade mineral oil, that you can purchase in Bed, Bath & Beyond. For my table accents, I am borrowing everyday items from my kitchen. Starting with olive branch salt and pepper shakers. As you all know by now, I LOVE to use salt & pepper shakers to carry a theme. It is an easy inexpensive accent that adds so much to the table. 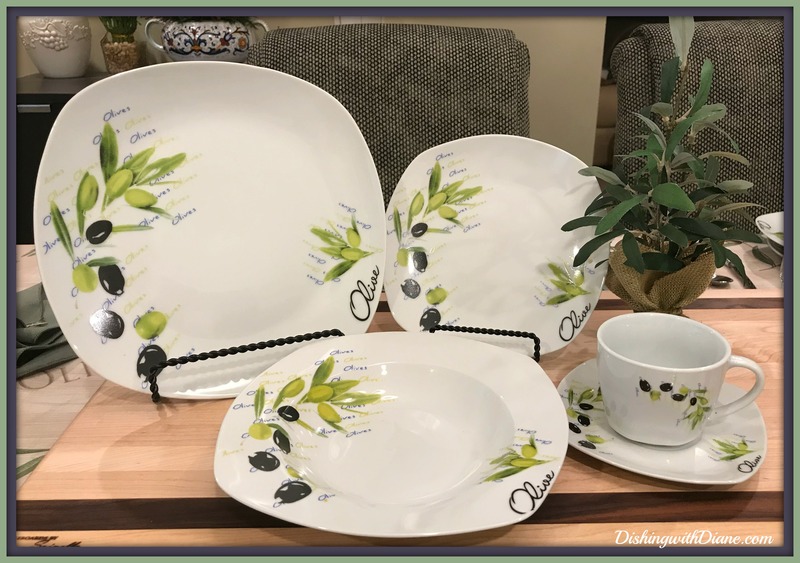 The salt and pepper shakers are by Bonita Home and match the dinnerware in cream ceramic with the olive branch design. 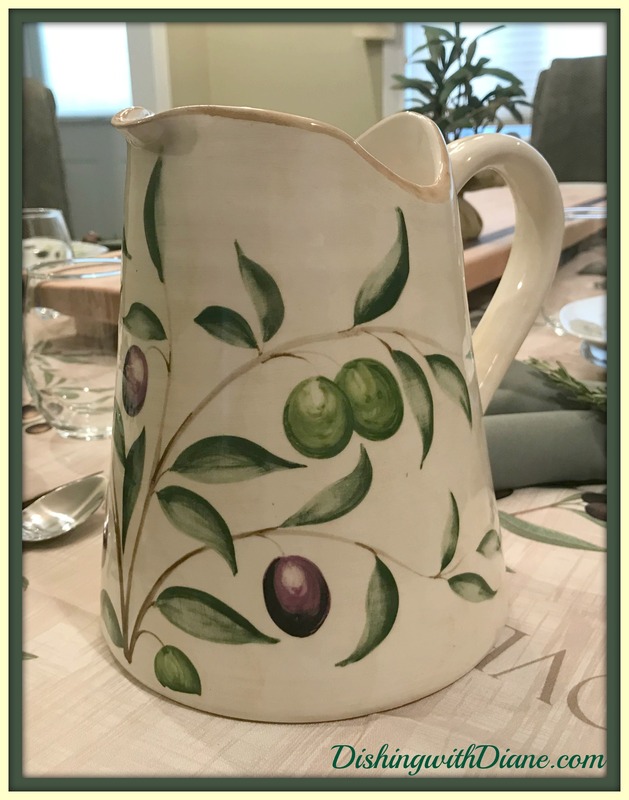 Adding to the olive branch theme is a water pitcher that I bought in Sur La Table a few years back. Not the same manufacturer but it blends in perfectly. You always have to shop your house first. Some matching dish towels from the kitchen for any spills and now I am done. Well almost... The polenta board tablescape may be complete but not the polenta board lunch. 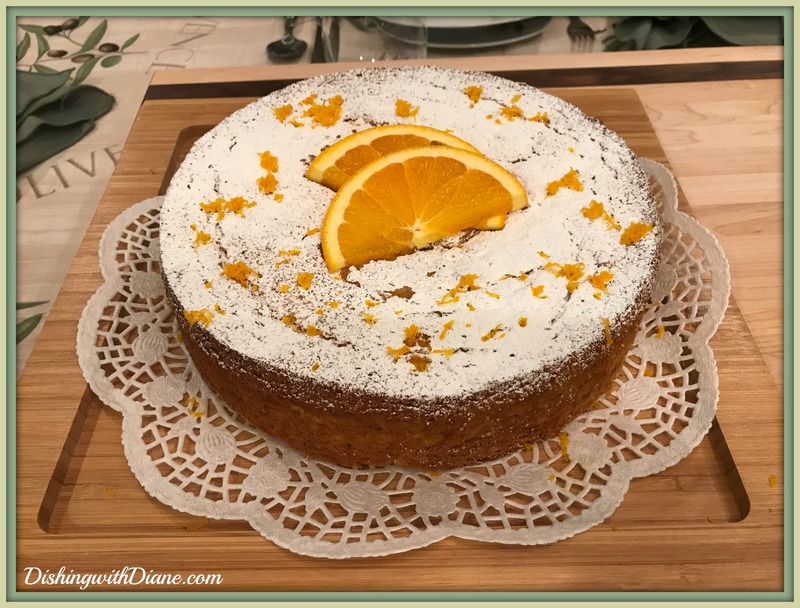 In addition to the salad and homemade crusty olive bread, there is always room for dessert and I chose to make another Italian favorite- Olive Oil Orange Cake. I remember my parents eating this cake for breakfast with coffee. It is close to a sponge cake and doesn’t have a strong taste of olive oil at all. It has the hint of orange flavor and Bob tells me that it tastes like the filling of sfogliatelle pastry. All my friends were good sports and ate off the board (made clean up a lot easier) and some are going to try this dish with their families. It is a lot of fun. Between the salad, bread, polenta and cake, this was the perfect meal. (I set the table just in case bowls were preferred). (Don’t forget the recipes at the end of the post)! 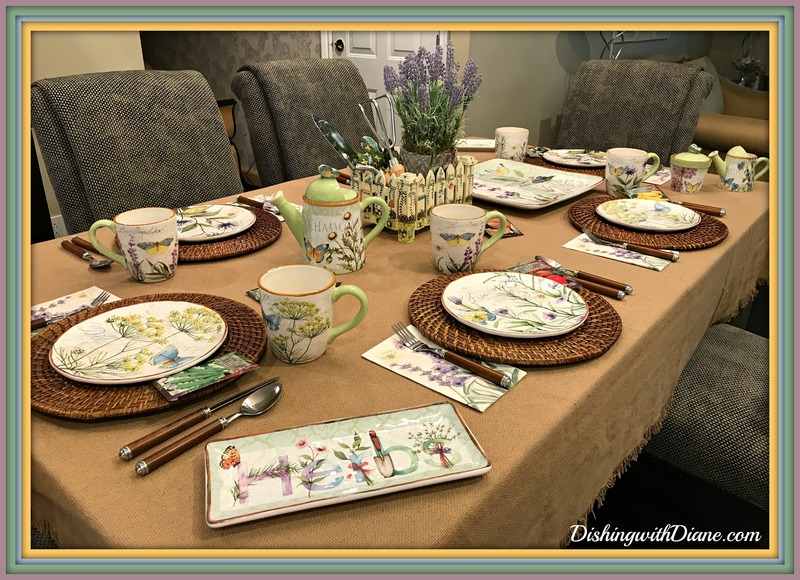 If you enjoy the posts, please spread the word and ask your family and friends to become a member of DishingwithDiane.com by entering their e-mail in the box in the right hand column of the home page or join via Facebook. Once you become a member, you’ll never miss a post again. Heat oil in a large skillet over medium high heat. Add the onion, garlic and a pinch of salt and sauté for 5 minutes. Add the sausage meat and brown. Add another pinch of salt, pepper, red pepper flakes and ground fennel and mix well with the onion / sausage mixture. (Adjust spices to your liking). Add the mushrooms and sauté until soft with a golden-brown color. Add the wine and scrape up all the brown bits in the pan from the sausage. Cook until wine has evaporated. Add the 8 oz. can of unsalted tomato sauce and 2 tbsp. fresh minced parsley. Stir the 1/4 cup broth with the 2 tsp. cornstarch until dissolved. Add the cornstarch and broth mixture to the skillet to thicken the sauce. OR * 1/2 cup heavy cream can be substituted for the cornstarch and broth mixture. Lower the heat to simmer and cook for 10-15 minutes until the sauce is thickened to your liking. Taste for seasoning. While the sauce is simmering, prepare your polenta according to package directions. When the polenta is done add 3 tbsp. butter and 1 cup (or more) grated cheese. Mix well and then take off the heat. Once the sauce is off the heat, add 2 more tbsp. butter and mix well. Ladle the polenta into shallow bowls if you are not going to be using a polenta board and top with the sauce. Serve with additional cheese, if desired. Prep the fennel: Trim the fennel bulbs top and bottom. If you’re working with a larger, older fennel, particularly one that is spotted like this one, remove the outer layer. Now cut the bulb into quarters, then slice each quarter very thinly from top to bottom, making sure that each slice has a bit of the base, which will hold the slice together. Prep the oranges: Trim them top and bottom, then take a paring knife and cut from top to bottom along the sides, between the pith (the bitter white stuff just under the peel) and the flesh. Once the orange is peeled, trim off as much of any remaining pith as you can, then slice the orange horizontally into thin, rounds. Compose the salad: Arrange the fennel and orange slices decoratively on a serving plate (or, even better, on individual plates if you have the time). Season with salt and, if you like, freshly ground pepper. Garnish with the black olives if using and drizzle everything very generously with the olive oil. And for an elegant final touch, if you like, top with bits of fennel frond. In a large bowl, combine flour, salt and yeast. Add water and stir until a shaggy dough forms. Add in chopped olives and gently mix in with your hands just enough to incorporate them . Cover bowl with plastic wrap, and let dough rise at room temperature for 10 hours (or overnight). When you’re ready to bake, preheat oven to 450ºF. Place a 4 qt. Dutch oven into the preheated oven, without lid, for 30 minutes. While Dutch oven heats, turn risen dough onto a well-floured surface and form into a ball with floured hands, dust loaf lightly with flour. Cover dough loosely with plastic and let rest for 30 minutes. Then, with floured hands, carefully place loaf in preheated dutch oven. With a very sharp knife, slit the top of the loaf in several places. Cover Dutch oven with its lid and bake for 30 minutes. Remove cover and bake for 12 minutes more. Remove loaf from Dutch oven and cool completely before slicing. This entry was posted in All Occasion Tablescapes, Desserts, Salads, Sauces on April 22, 2018 by aries041158. We had a mini heatwave here in the Northeast the past few days. The temperature went from very cool weather to being in the 90’s in a matter of days. Since the weather has been so unpredictable, I have had a late start planting my garden. We finally bought our plants and they are all in the ground. Now we wait for the first bounty. I feel like my Dad when I plant a garden. He followed in the footsteps of his family and planted a vegetable garden every year. Back in Brooklyn, all the neighbors would share whatever vegetables they grew. Sharing your garden bounty is always a nice part of summer. Bob and I usually plant tomatoes, zucchini, bell peppers and some herbs. This year I am increasing my herb plantings. I don’t know about you but it seems I am constantly buying herbs in the grocery store. I buy basil and within a day it turns brown. My parsley turns yellow almost immediately. So I have decided that this year, is the year of the herb garden. I have added thyme, sage, dill, rosemary and tarragon to the usual parsley and basil. 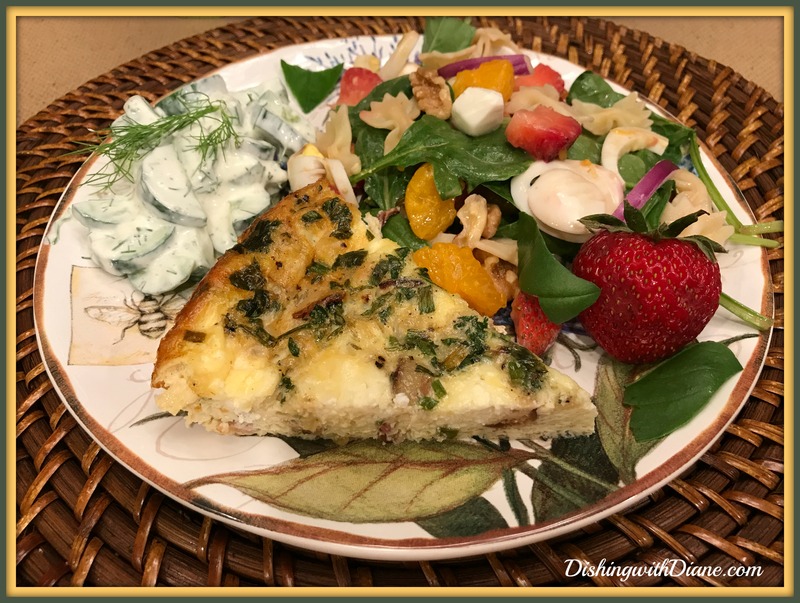 While I was planting the herbs, I thought it would be great to make a quiche using a combination of herbs for a light brunch with a side salad. 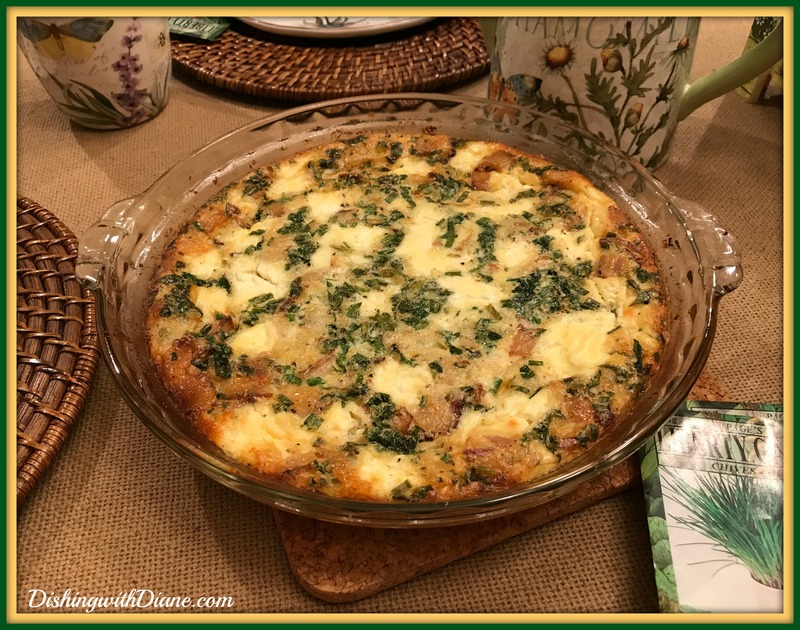 So I did some research for a new recipe and I found one for a “Crustless Herb Quiche”. I want to share this recipe with you today. Very fast and very easy. Along with the quiche I made a Baby Spinach Salad. My take on an old classic. The classic spinach salad minus the bacon, fresh mushrooms and croutons. 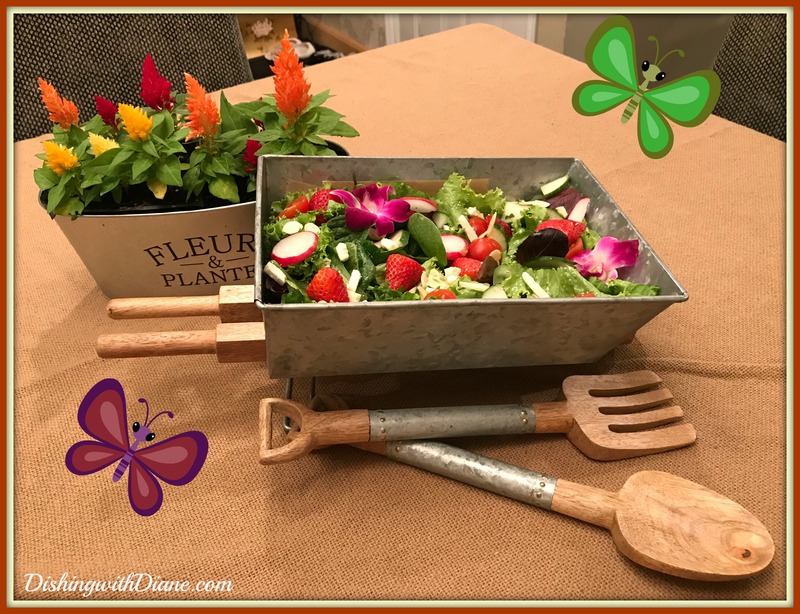 The right salad dressing means everything to enhance the flavor of a salad and I have had the good fortune to meet a wonderful fellow foodie named ” Cucina Teresa” on one of my Facebook food groups who makes the perfect salad dressing. Spinach salad calls for balsamic dressing and Cucina Teresa makes the best creamy balsamic salad dressing I have ever tasted. (which I highly recommend for this spinach salad recipe.) I just can’t say enough about it. I know I sound like a walking advertisement, but it’s that good. I have included her ordering information after the “Recipe” section at the end of this post, in case you are interested in trying her dressing. You will not be disappointed. Another salad for this brunch is one my mother made all the time with cucumbers from her garden. 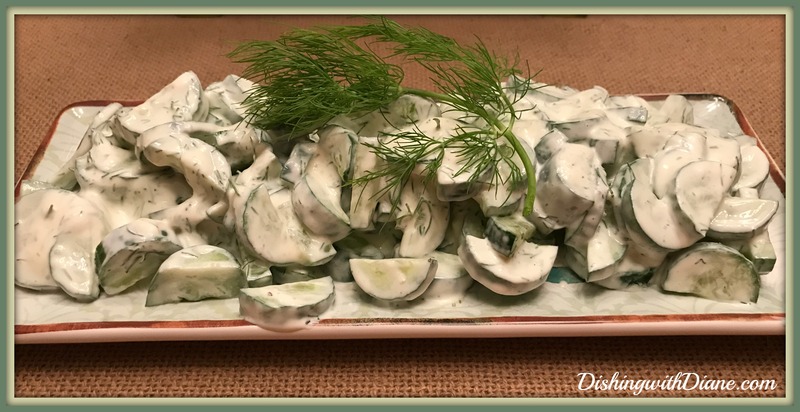 Cucumbers with Sour Cream and Dill. What better way to enjoy herb inspired food than on “herb” themed dishes. I have just the right set. The dishes I am using for brunch are made by Certified International, designed by Susan Winget. I just love her work. 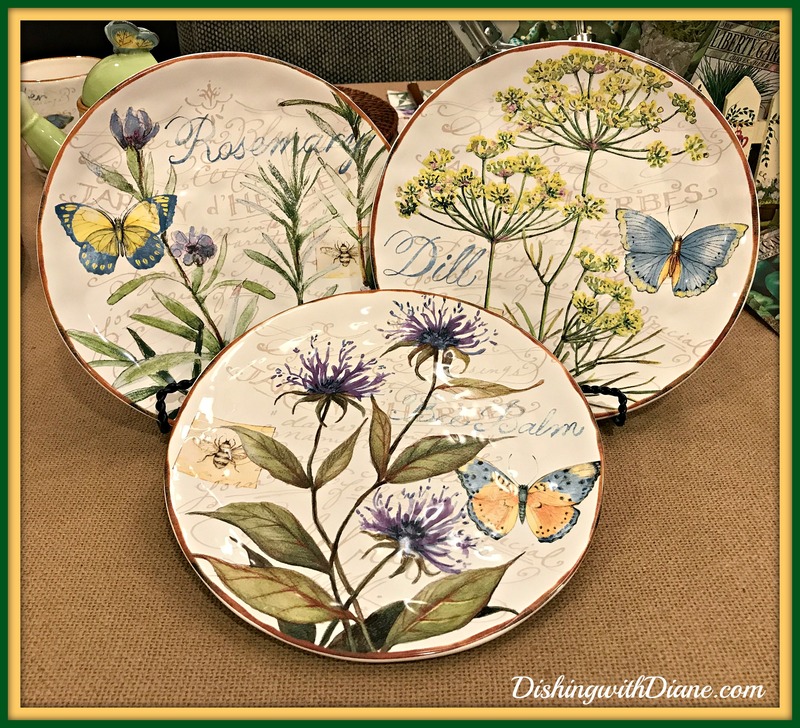 It is an earthenware dish with a cream background with designs of herbs, butterflies and bees in shades of blue, lilac, green and yellow with a brown rim. 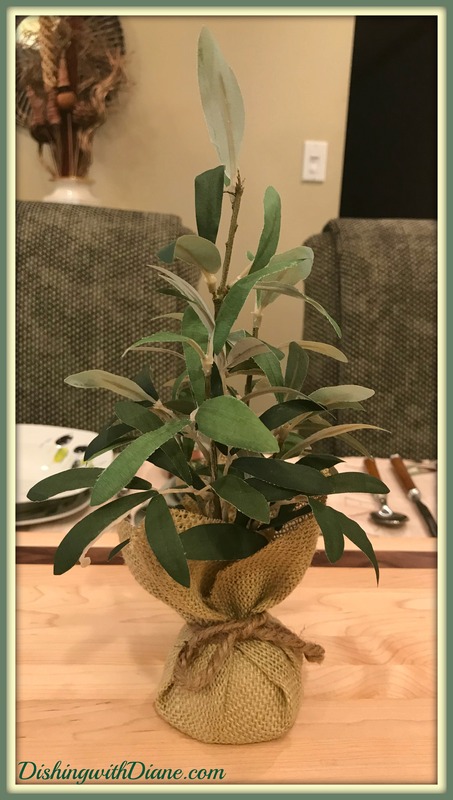 The name of the featured herb is on each plate. 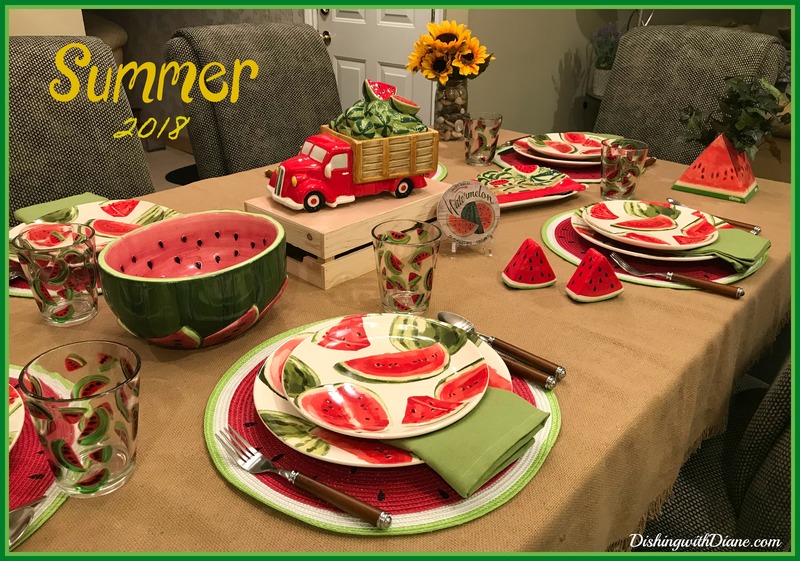 I only bought the salad plates and mugs along with a few serving trays because I intended to only use this set on the patio, just for dessert and coffee/tea after dinner on summer nights. 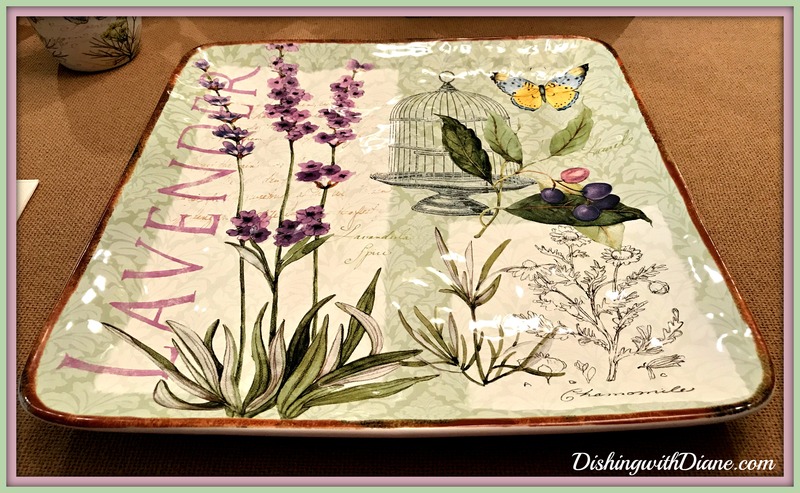 The large serving tray is 14 X 14 and highlights lavender and chamomile alongside a birdcage and butterfly. The tray is cream and lilac with various shades of green and a brown rim. The small serving tray is 11 x 5 and is cream and green with a brown rim. The word “herbs” is spelled out on the tray with a design in lilac, blue and green that features not only herbs and a butterfly, but a gardening tool as well. The set comes with the most adorable tea pot, creamer and sugar bowl that caught my eye first. Both pieces have a cute butterfly attached to the lids. 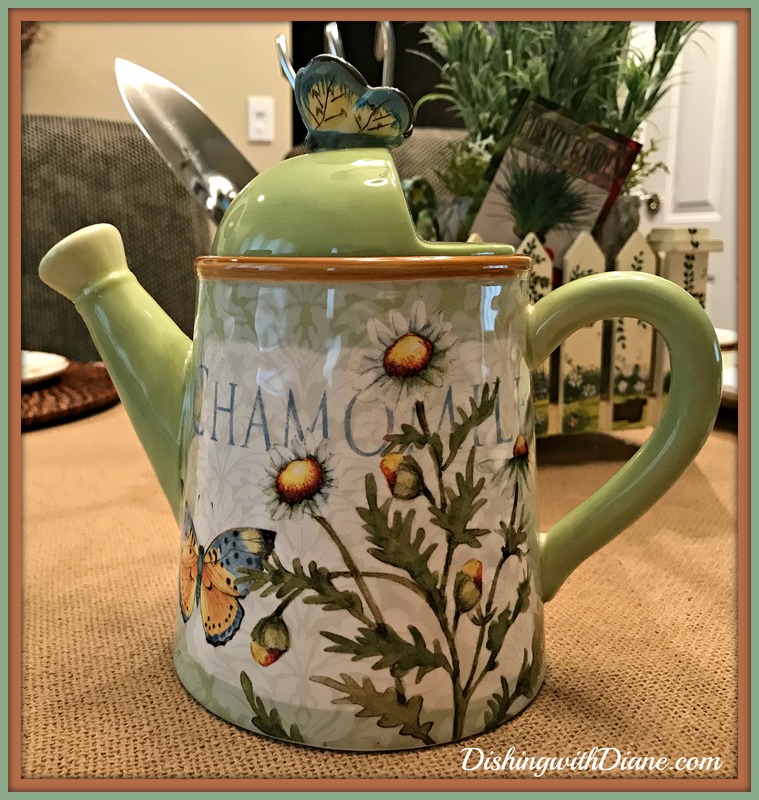 The tea pot is a watering can with accents of lime green with a design of chamomile flowers (one of my favorite teas) and a butterfly on the lid. 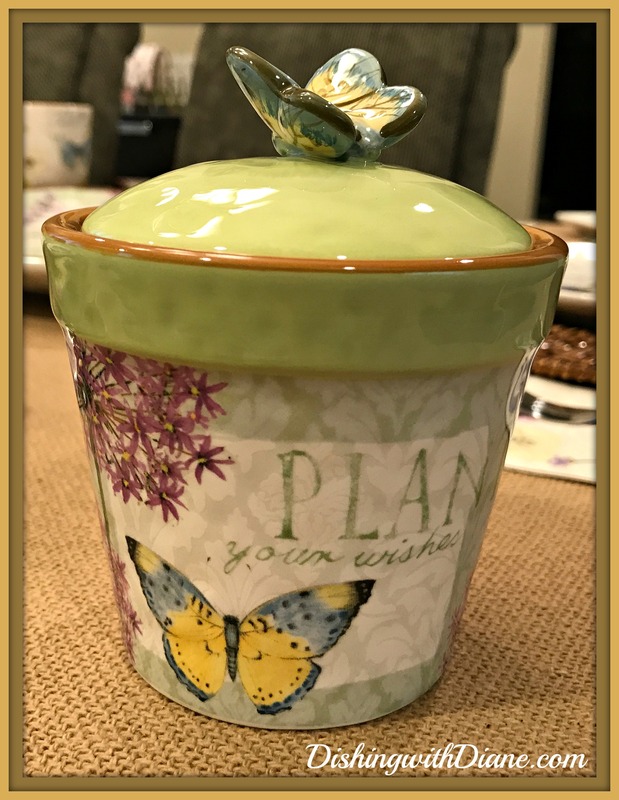 The sugar bowl is a flower pot with accents of lime green with a floral and butterfly design, a butterfly on the lid and the message on the creamer says, “Plant your wishes”. 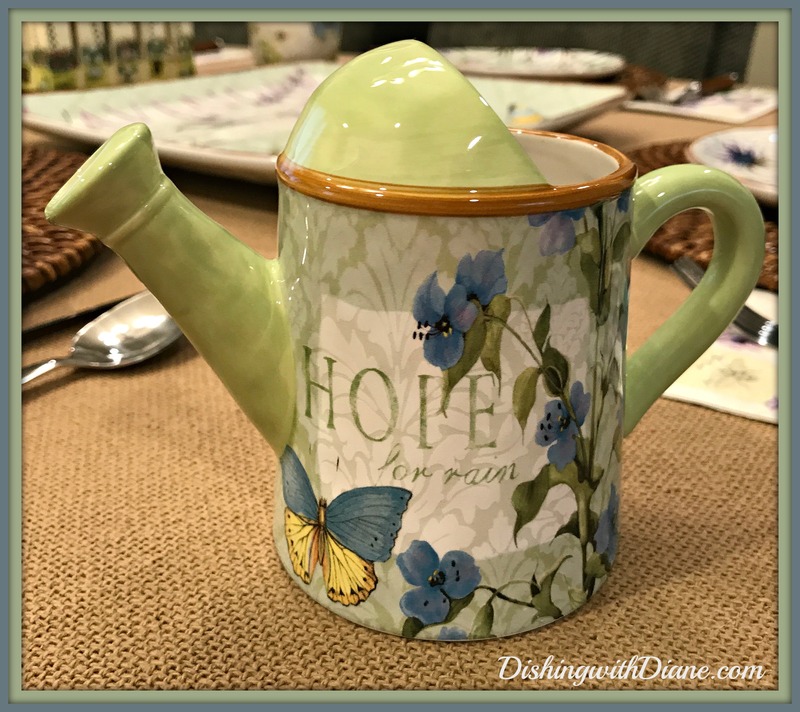 The creamer is also a watering can, with accents of lime green and a similar floral and butterfly design and the message on the creamer says, ” Hope for rain”. 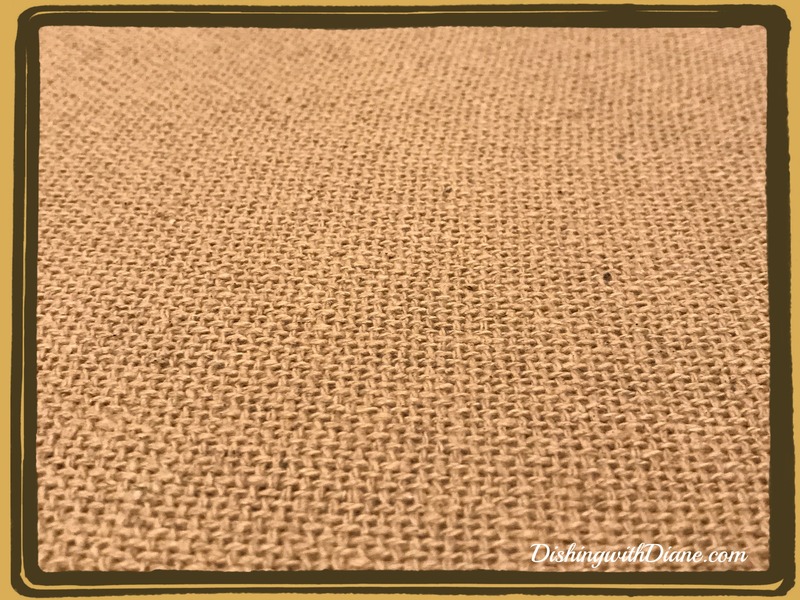 I am using the same burlap tablecloth that I used for Easter. 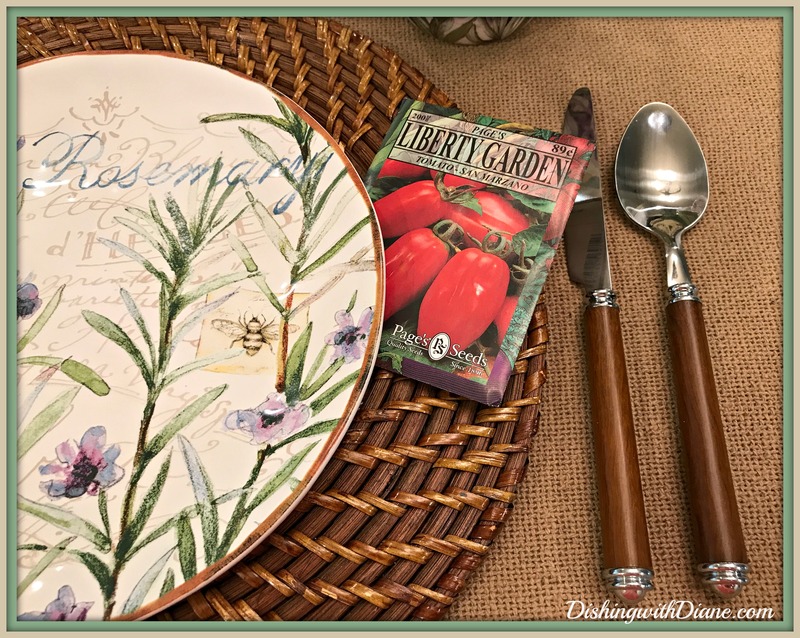 I just love this tablecloth and find it is the perfect backdrop for a lot of my dish collections that feature garden themes. You will be very surprised, but I am not using a cloth napkin. For this tablescape I am using a paper guest/dinner napkin and therefore no napkin rings. I found this napkin in a gift shop in Stony Brook, NY and it turns out that the napkin is also by Susan Winget. Somehow, I am drawn to her work everywhere I go. 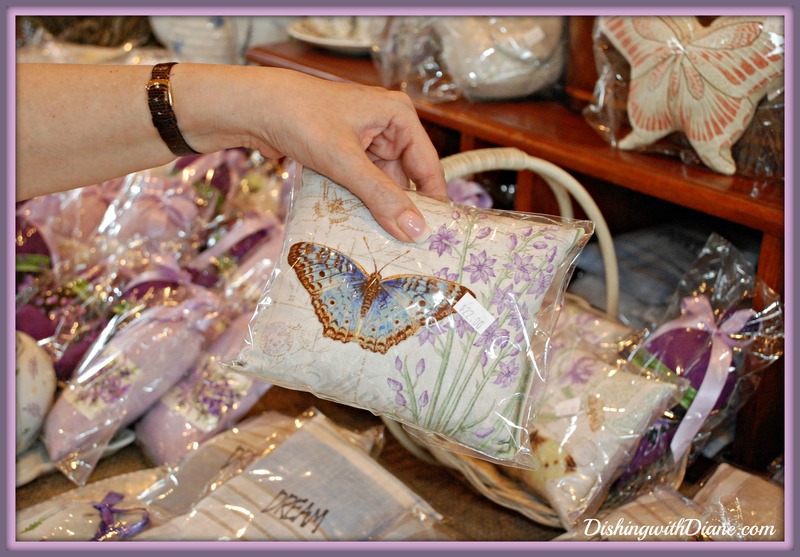 Susan’s work reminds me of two other designers that I admire, Susan Branch and Marjolein Bastin. 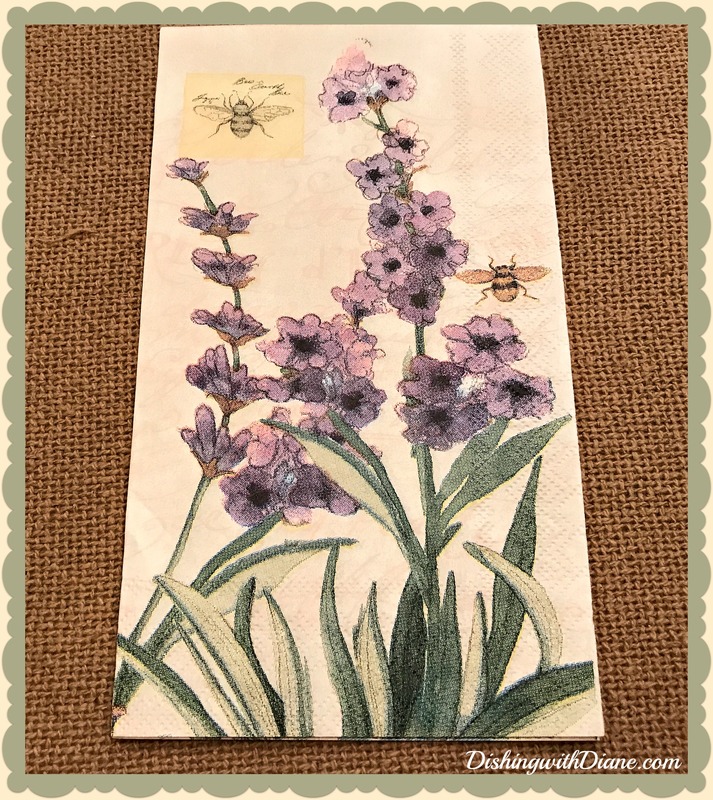 The napkin is cream with lovely branches of lavender and a few bees. Perfect for the dishes. Thinking about it now, I should have bought more than one package. 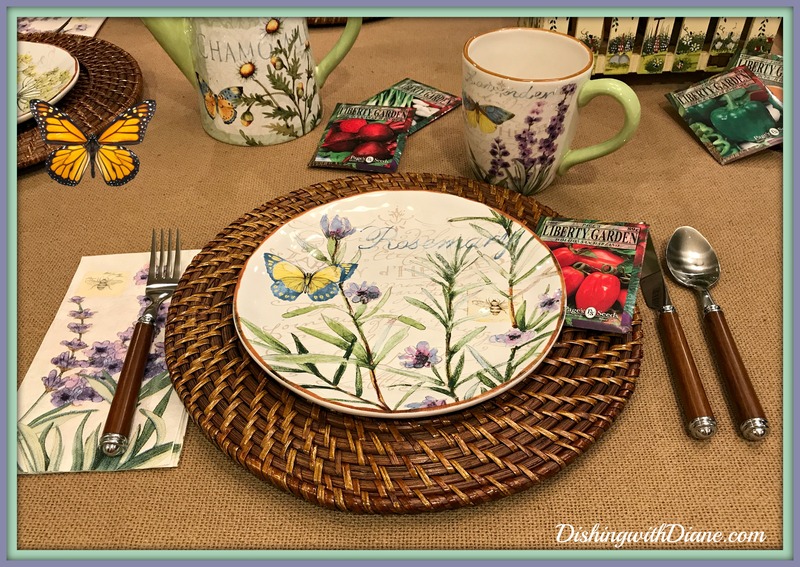 No placemats either for this tablescape, just my brown rattan chargers. Another natural earthy addition to go along with the theme. I suggest if you buy only one set of chargers, purchase brown rattan. They are very versatile. I have a new flatware purchase that I bought for a different dish collection but thought that it would be perfect on this table. 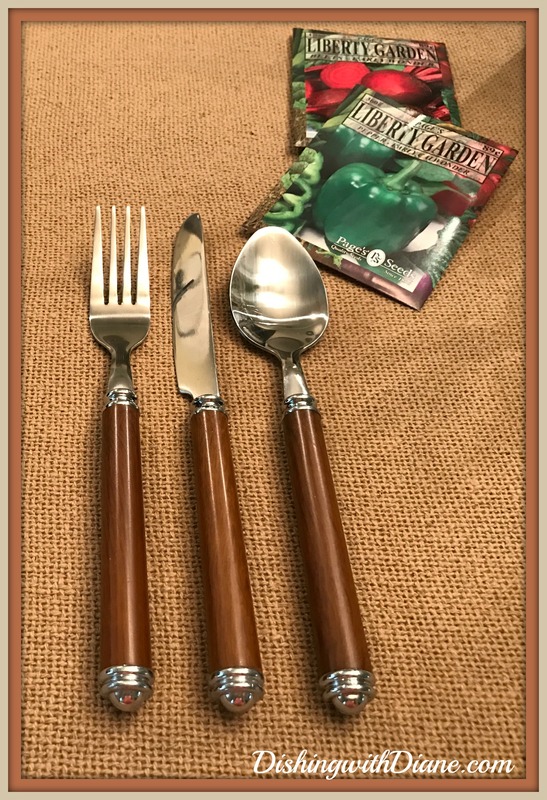 The flatware has wooden handles in the same shade of brown as the plate rim and they coordinate perfectly with the chargers. No glassware, I am just using the matching mugs from the set. The mugs are over-sized and have a mint green handle and the same designs as the salad plates. 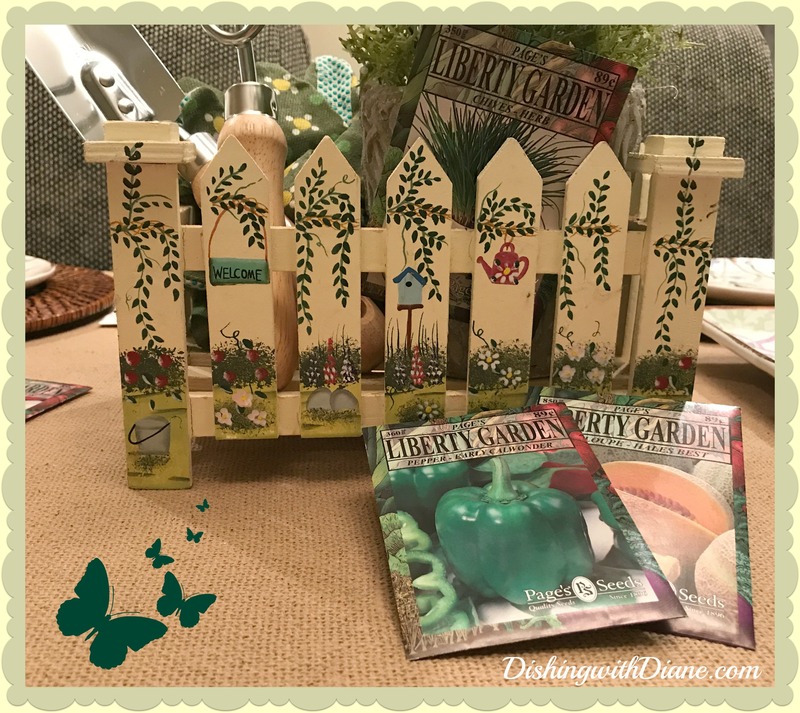 My centerpiece is all about gardening and I am using a wooden cream picket fence plant holder that was given to me back in the day when my son was still in grade school. 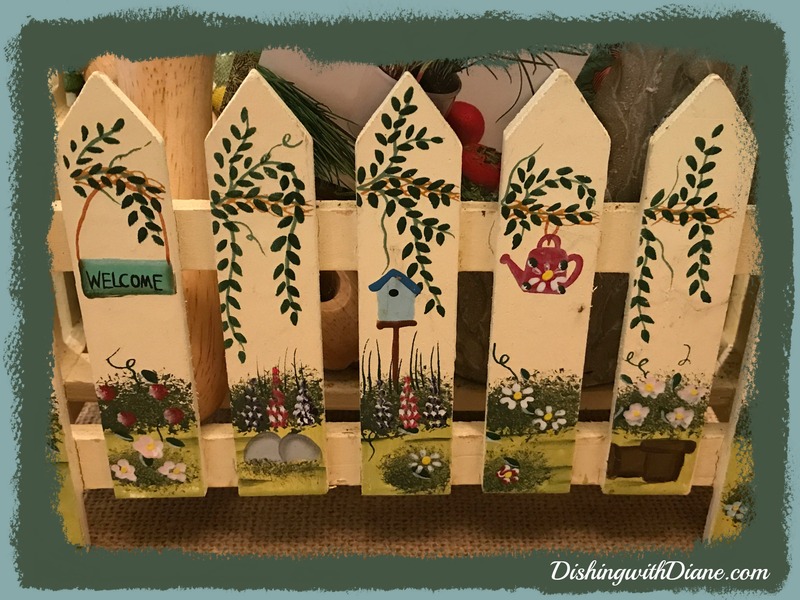 The plant holder has hand painted designs of watering cans, birdhouses and flowers. This planter is over 20 years old. Close up of the hand painted designs. I am filling the plant holder with an artificial Lavender plant (you know how I am with live plants and yes, after a good two years of tender loving care, I killed the bamboo. A story for another time). Anyway, this lavender plant reminded me of the design on the napkins and matches the colors on the plate; and for $ 9.99 in Homegoods it was a great bargain. I am adding a few garden tools, garden gloves and some packets of seeds to complete the centerpiece. I just love the way the centerpiece turned out so I am leaving it on an end table in the living room for the entire summer (it was put together in five minutes). 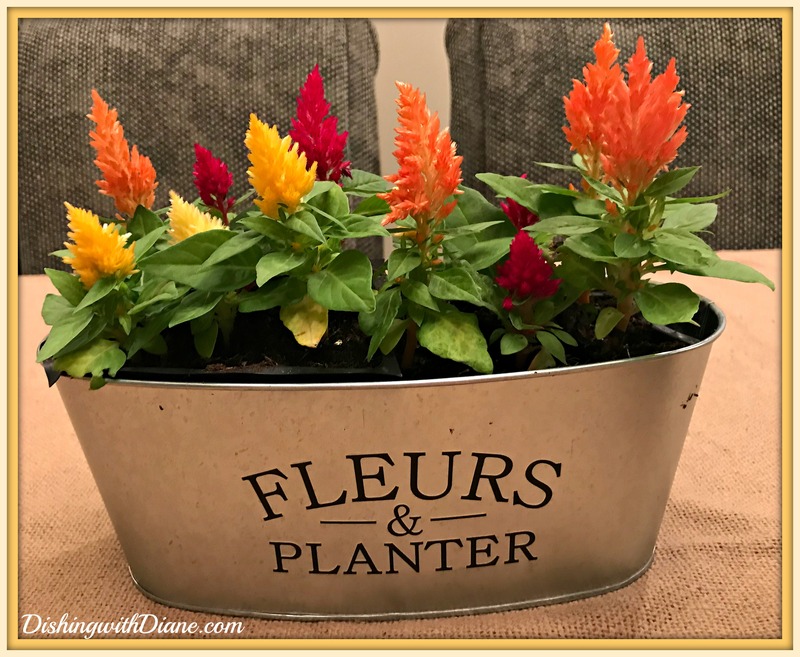 For a little fun and a pop of color, I have added a packet of seeds to each place setting for decoration that can be used as a favor. Favors do not have to be expensive. 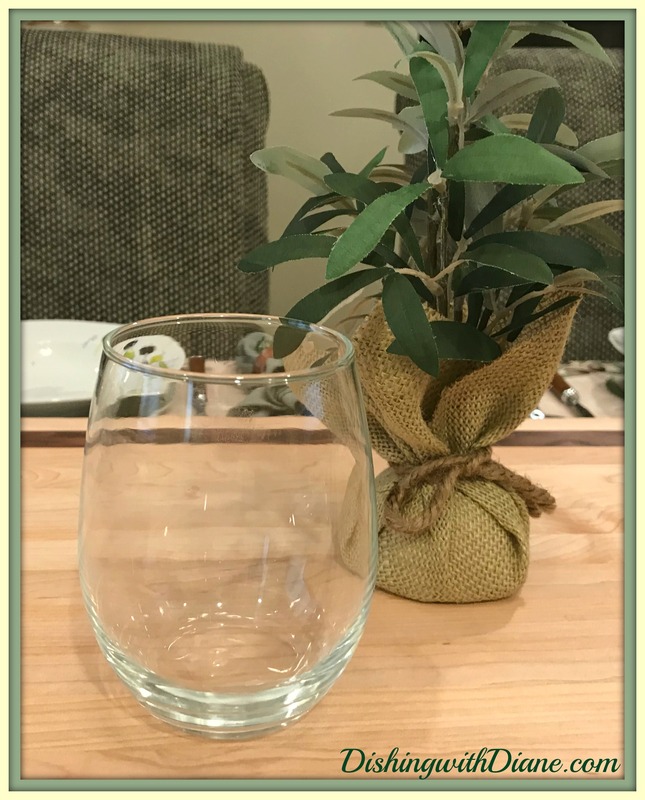 Just a little token as a reminder for your guests of the party, luncheon, dinner or gathering is enough. 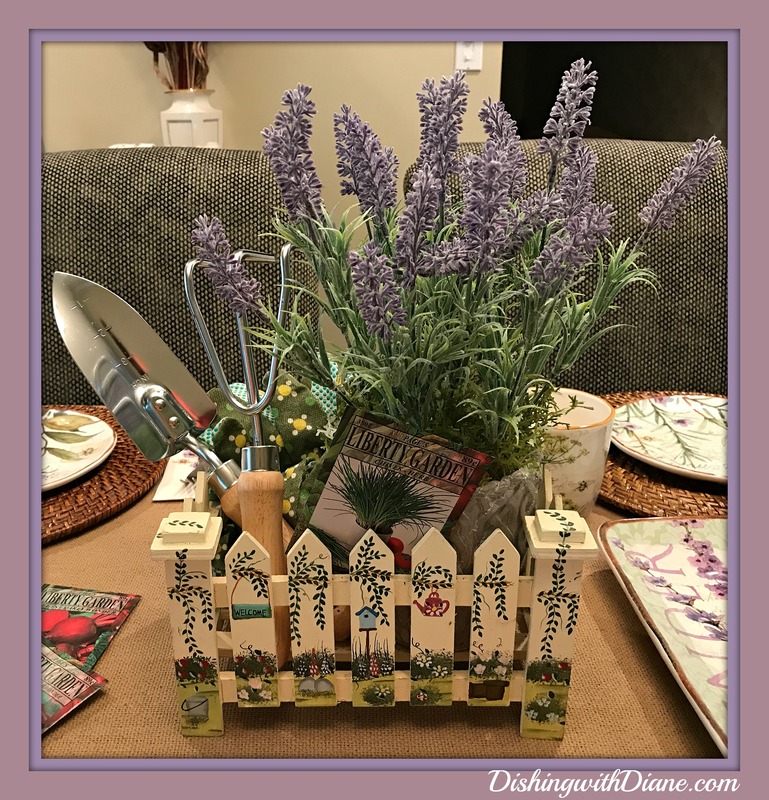 This tablescape and centerpiece, reminds me of the visits Bob and I have made to a Lavender Farm in East Marion, NY called “Lavender by the Bay”. 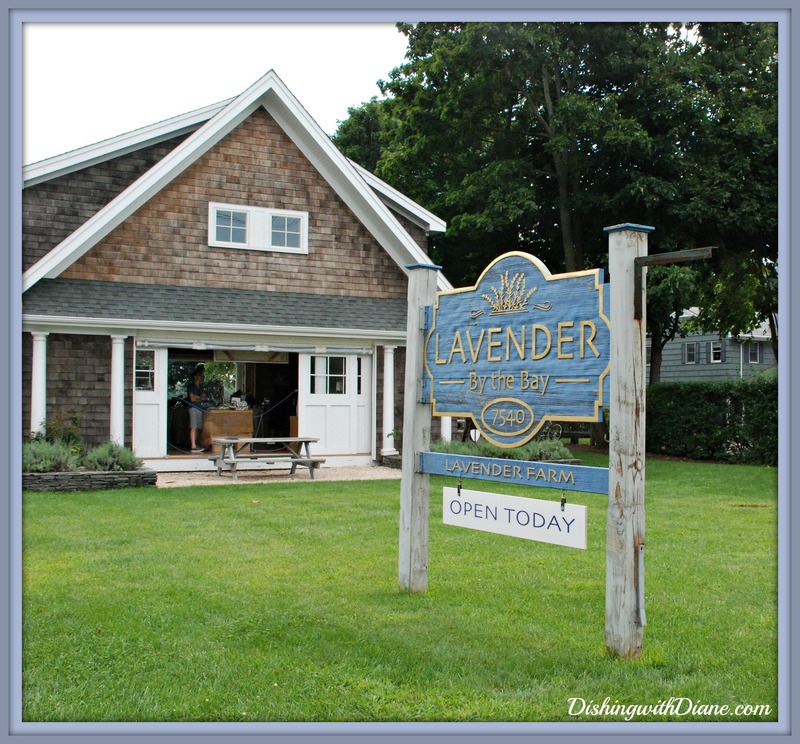 If you are ever on Long Island, NY and want to take a drive and see a gorgeous field of lavender, that is the place to go. 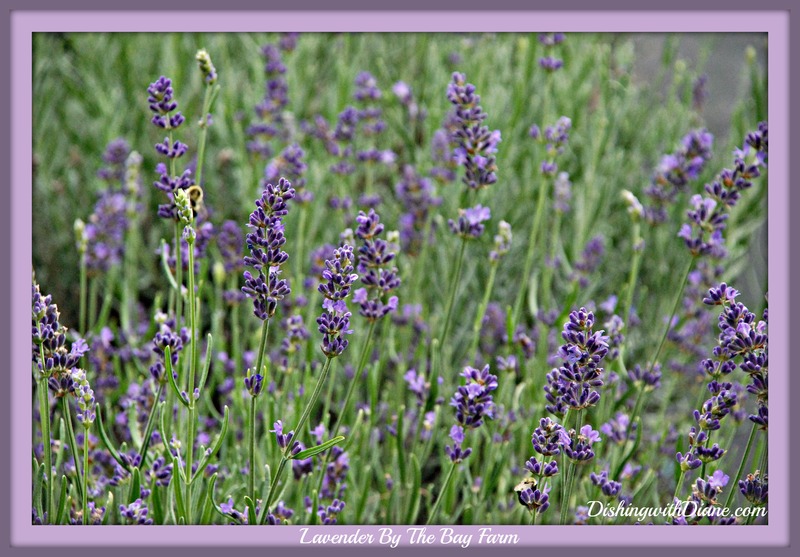 Together will the dried lavender, they also sell lavender products from sachets to lotions, including lavender honey (one of my favorites). 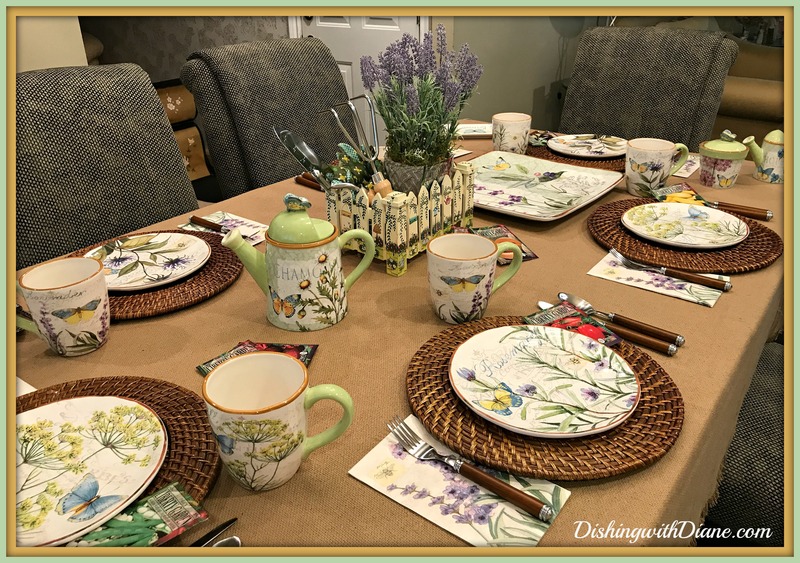 I hope this tablescape gave you some inspiration to try a new recipe for brunch, take a drive to a lavender farm or plant an herb garden of your own. Good luck to anyone with a garden this year and I will keep you posted on the success of my garden. Don’t forget the recipes at the end of the post. Preheat the oven to 350 degrees. Cook bacon in a medium skillet over medium heat, 3 minutes. Add onion and cook, stirring frequently, until soft, about 15 minutes. Stir in herbs and remove from heat. Spray a 9-inch glass pie dish with cooking spray. Arrange onion-herb mixture in dish. Whisk together eggs and milk; season with salt and pepper. Pour into dish and dot with goat cheese. Bake until set and golden brown, about 30 minutes. I use a creamy balsamic vinaigrette for this salad. All ingredients can be adjusted to your liking. Cook pasta according to package instructions, drain. Set aside. In a large bowl toss together pasta, spinach, strawberries, mandarin oranges, walnuts, mozzarella pearls, cucumbers, red onions, scallions, sliced egg and tomatoes. Mix well. Just before serving pour dressing over salad, toss, add some fresh basil and serve. Add cucumbers, and toss to coat. Garnish with more dill, if desired. 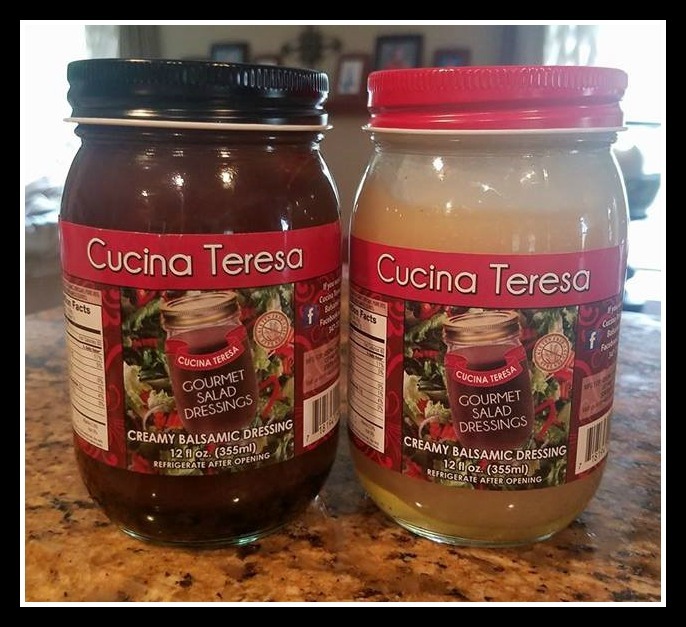 The Cucina Teresa website is under construction at the moment but you can inbox her facebook page, “Cucina Teresa” and she will give you prices and directions on how to send payment for this fantastic product. 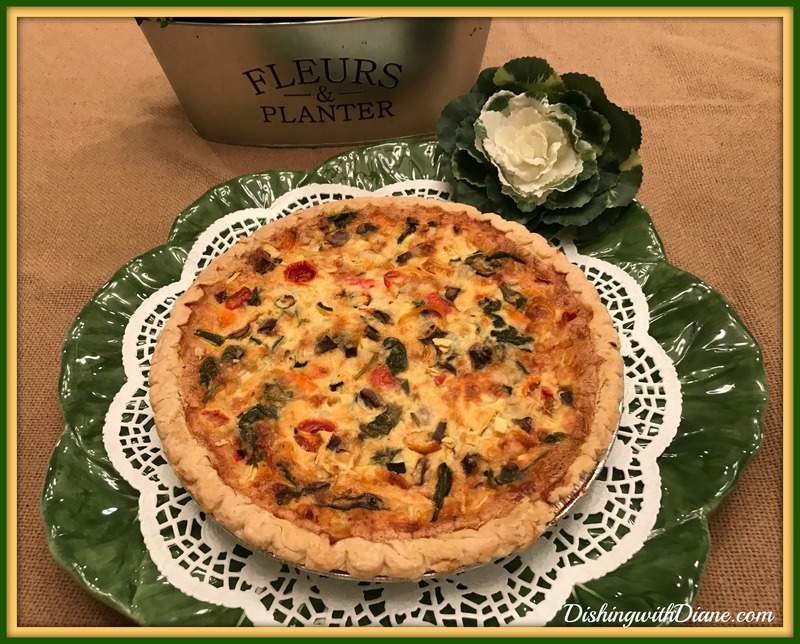 This entry was posted in All Occasion Tablescapes, Quiche, Salads, Side Dishes on June 17, 2017 by aries041158.